2014 brings new learning and a fantastic work opportunity. This year I have been seconded for one year to be a Facilitator. I will be working for the Ako Hiko cluster for three days of the week and two days of the week I will be working in three Manaiakalani Cluster Schools. 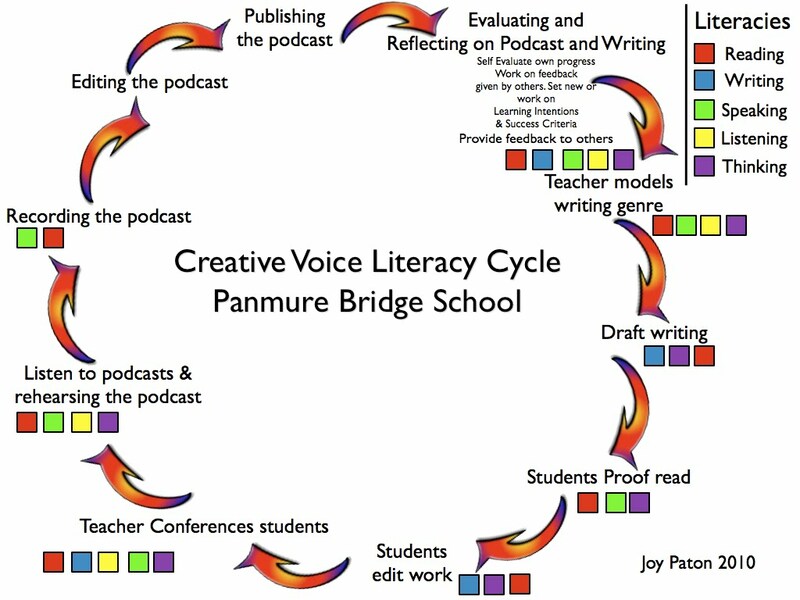 Last year I was given the opportunity to work with three new to netbook teachers as a facilitator within my own school (Panmure Bridge School). I worked .2 in their classrooms. The facilitator role was very successful and I enjoyed it. My team of teachers were enthusiastic and had a positive attitude in giving things a go. We had lots of fun, making movies for the Manaiakalani Film Festival. All of my team are equipped to use the school video camera, to transfer footage from the video camera to their computer, to edit and publish their movies onto their blogs. As a Facilitator I loved going along to Toolkit sessions and then the next day saying to the teacher "I went along to this amazing tool kit session yesterday afternoon, it's on...... would you like me to teach your class it?". They would say "Yes go for it". The students were very excited about being the first in the school to try this new application out, trying the app before my own class. The students enjoyed making flipping eBooks and after a while would present their learning on a flipping eBook. Skills that were taught in lessons were applied at a later date without me modelling to them or being in the room, which was great. I look forward to working with teachers and their classes this year. It'll be great to share my knowledge and skills with others and to utilize my Masters degree. I would like to thank Mrs Dorothy Burt, Mrs Fiona Grant and the Manaiakalani Trust for giving me this wonderful opportunity to grow and to be part of introducing 1:1 digital learning environments in the Mt Roskill area. This project has provided me with an insight over the needs these new year five students have when they enter into a 1:1 digital learning environment. There is a need for the year five students to be learning the technical skills sooner so that the curriculum learning objectives can be covered right at the beginning of the year when they enter into the classroom. 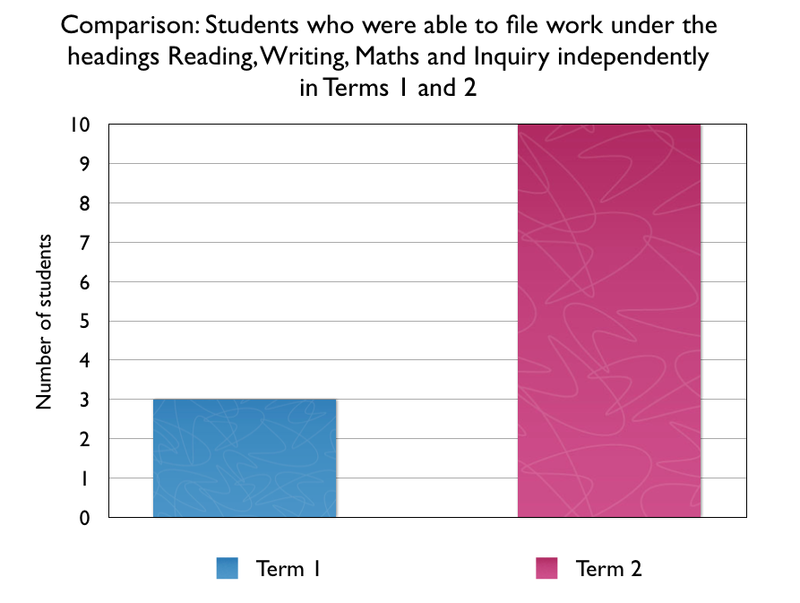 When my target students were interviewed at the start of the year their knowledge and experiences around E-Learning and technical skills were limited. Some of the students had more experiences than others in being monitors and in using the three class desktop computers. 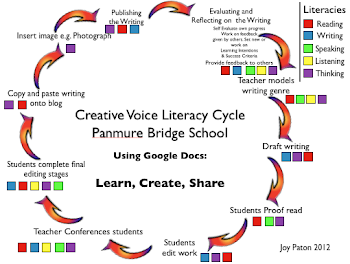 There is a need to equip students earlier in getting them to use the Google Apps for Education Package and to be blog authors at year four level. Since this project has been implemented six Chrome Books have been purchased and are used in the year four class. As part of my Manaiakalani Facilitator release I have created blogs for each student and have worked with every student to ensure each student has at least one post published on their blogs. My E-Learning Monitors: Caitlin, Angel, Jharda'e and Patrick have been a great support to the year four class and have helped the class teacher and students with Google Apps and Blogging. They have been called upon when I am teaching my class. Their knowledge and skills have been invaluable to this class as well as all the junior classes in the school. Some of the year four group who are confident fast learners with their class Chrome Books have posted a number of posts on their blogs. This year four group are also called upon by the classroom teacher to help the other students which is great. Every year four student has activated their Google Account and has been taught how to create documents. Some of the top performing students have created presentations. The class teacher has attended the tool kit sessions focusing on the beginners guide to Google Apps and class sites. She has got a class site in which the class can access their follow up reading activities. The teacher has been shown during a facilitation session the Teacher Dashboard and is getting the students to file their work so that she can comment on the students learning. 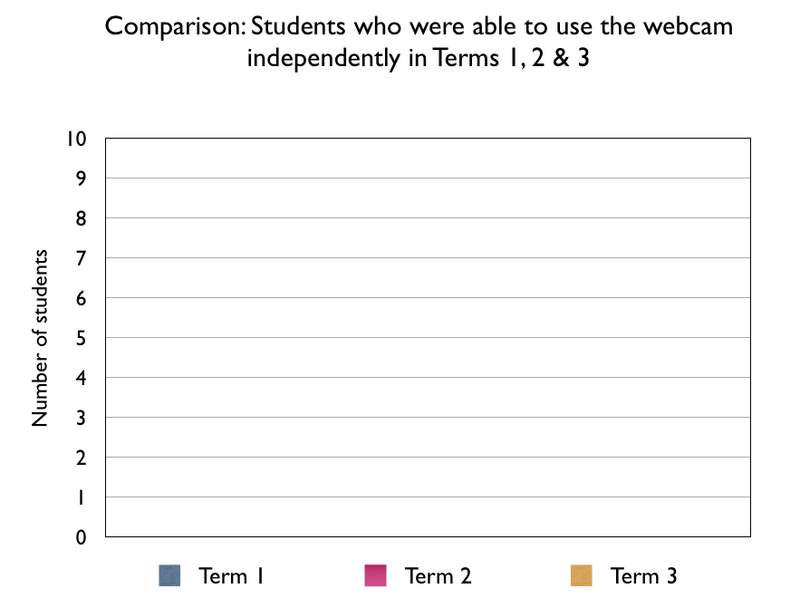 The year four students have been given a great start to when they enter in a 1:1 digital learning environment. I feel these students will be equipped with the knowledge in the technical skills and the understanding of the pedagogy Learn, Create, Share. At the start of term 1 2014, there will be more of an emphasis of the curriculum and objectives, and less of the orientation around accepting blog invites and activating the google accounts (technical skills) which all takes time. This project has been very successful. It has been a real team effort. In order to equip students to become successful learners in a 1:1 digital learning environment there needs to be a collaborative team approach. A collaborative team approach entails: getting senior managers, classroom teachers, students on board and utilizing student knowledge (peer mentoring). I found the more I utilized my own students by getting them to share their knowledge to younger students, the more receptive these students were. I loved taking my students to work with me to other classes when I did my facilitation among the classes. I would like to thank the Manaiakalani Trust for allowing me to carry out this project and for giving me the opportunity to share this project at the ULEARN 13 conference and to the Learning and Change network visitors. It was a great experience to push myself out of my comfort zone especially in the area of public speaking to teachers as a lot of my work is done behind the scenes. This year has been a year of pushing myself out of my comfort zone and putting myself out there. Being accepted into the Google Teacher Academy was a fantastic learning experience to share my MITA project on a global level and to network with others from around the world in Chicago. All students can log into their blogs. In Term 3 one of the traget students left the school and now there are only nine students in the target group. This has remained consistent across the year. 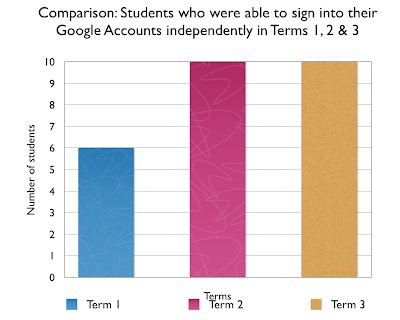 All students can log into their Google Accounts without the support from other students. 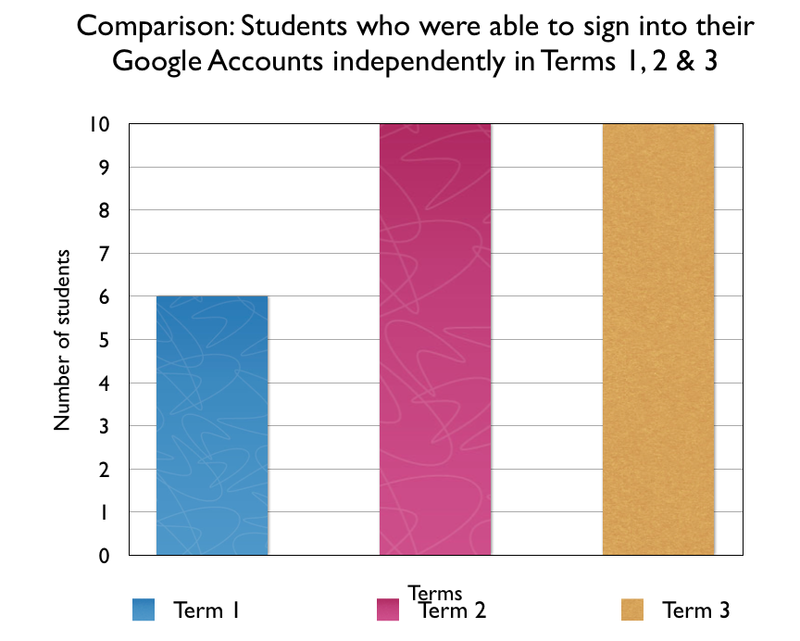 In term one, students were able to pick up the skill of logging into their Google Accounts independently with confidence and speed. 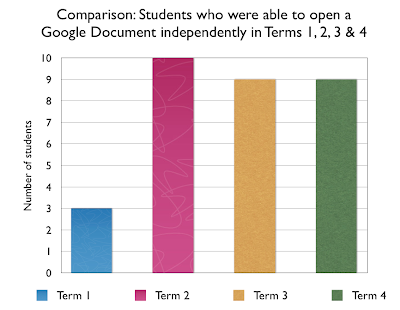 All students are able to open their Google Documents. Since term 1, gains have been made. Gains have been made since term 1. 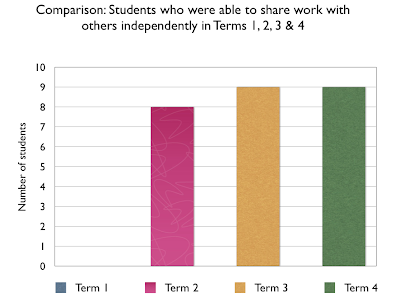 Students have developed confidence in sharing their work with others. The greatest shift was made in term 2. This has been consistent throughout the year, as opening of a Google Document has been a daily occurrence throughout the year. 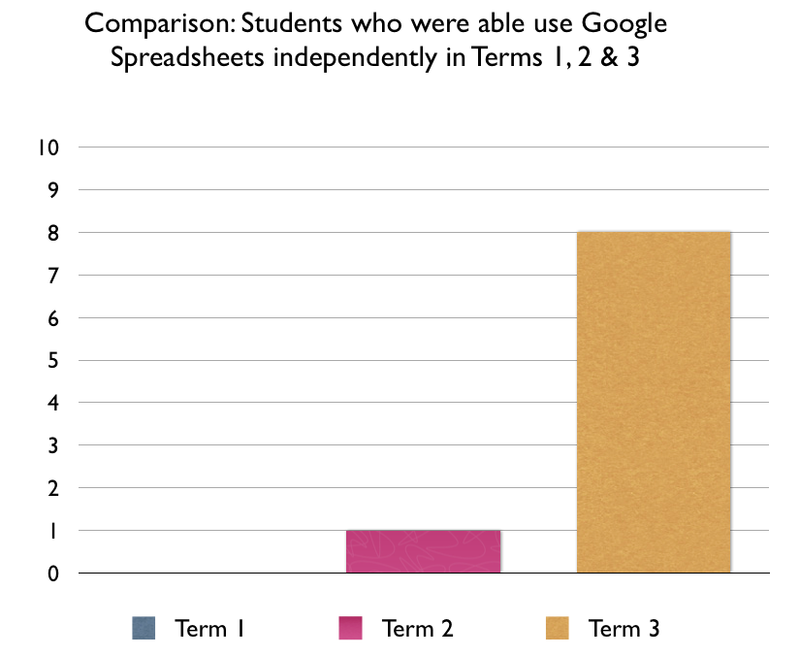 Students have had greater opportunities to use Spreadsheets later in the year. On Thursdays when I was on Facilitator release, Bronwyn my release teacher did a Current events quiz with them. Every week the students had to graph their result using Google Spreadsheets. 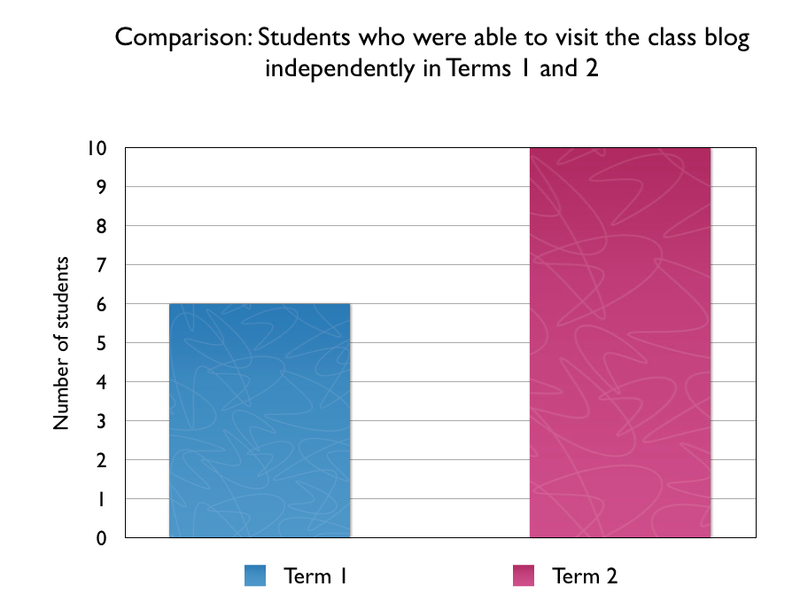 In term 4, I got my students to do a Statistical investigation on a topic of their choice. They had to collect, collate and present data digitally. They used Google Spreadsheets to carry out their investigations. 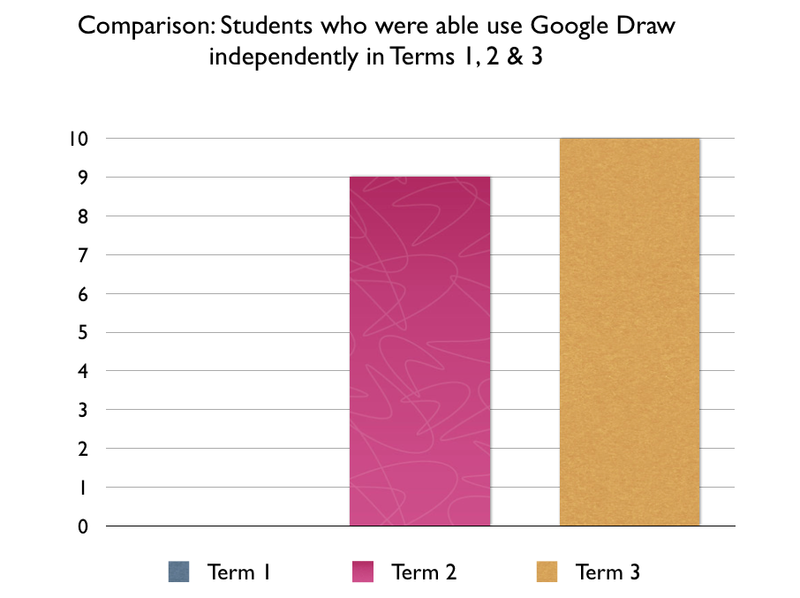 There was greater use with Google Draw in term 2 and throughout the year. Google Draw was used in creating concept posters in Maths, making brochures for our production in term 3 and creating water cycle diagrams in term 4. The students have had opportunities to use Google Draw throughout the year. There was greater familiarity in using Google Presentations from term 2 onwards. 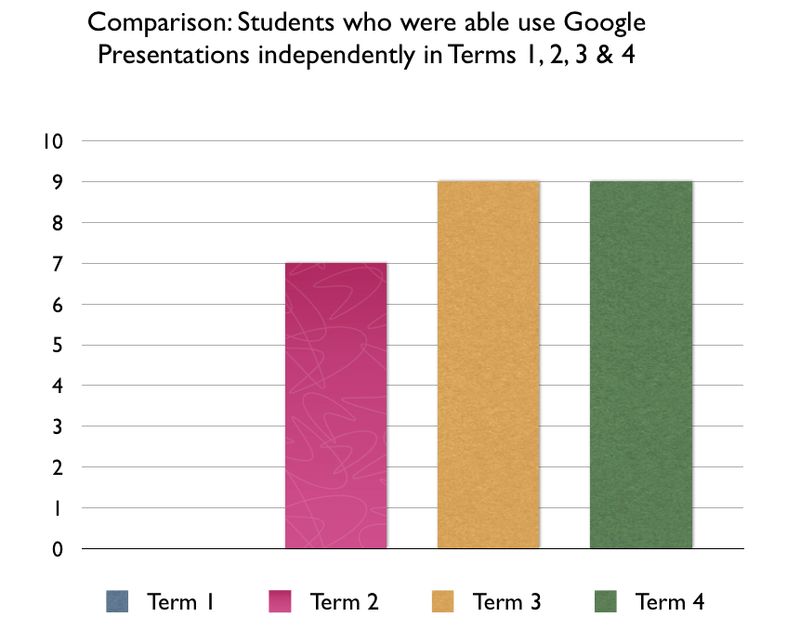 Google Presentations was used at the creating stage of the PBS Inquiry model, in homework presentations and was used for presenting new understandings in Maths (Maths Dictionary). Over time, students have become confident with embedding applications onto their blogs. 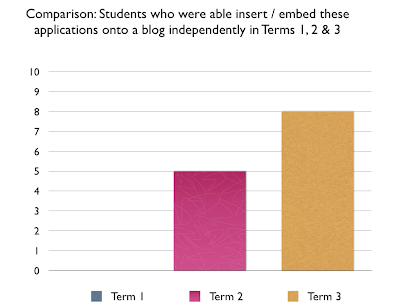 In term 4, all of the target students could embed applications into their blogs. 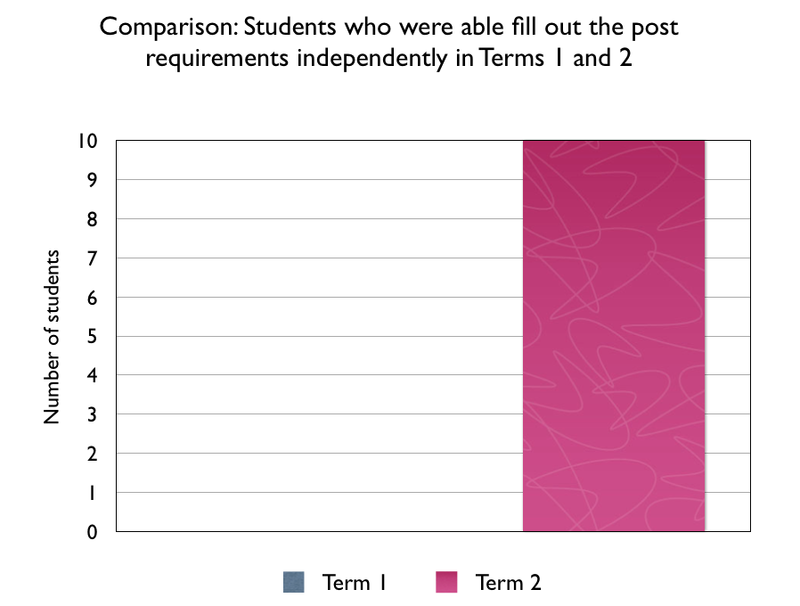 One of the barriers for these students was that the embedding process varied from different applications. Students grasped logging into their blogs from term 2. They became very confident in meeting this need earlier on in the year, as they realized that their blogs was the area for displaying their learning onto. The more posts they made the greater the views from audiences around the world. 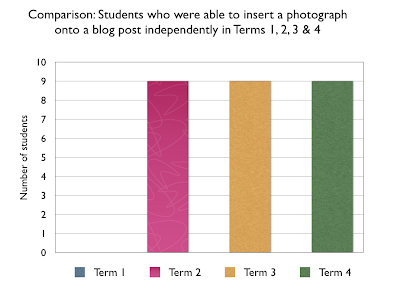 Term 2 the blogs became much more transparent to the students. They could see where their learning was going to and it was a viewing platform for all people involved: students, parents, teachers. They learnt earlier on in the year, that the more they posted the more hits they would get from around the world. The global audience was a great motivator for my students. In term 2 there was an increase with the number of students who were able to create new blog posts independently. This was consistent through out the year. In term 2 all students were able to upload a photograph onto their blogs. 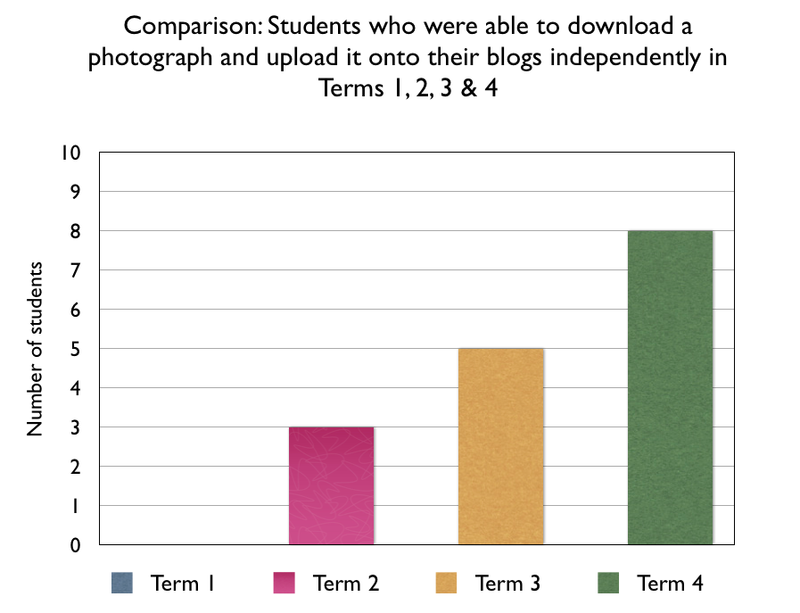 There was growth in term 2, as students had opportunities to upload individual, group and class photographs onto their blogs. In term 4 three students were able to insert movies onto their blogs. This area has not been a major priority this year. 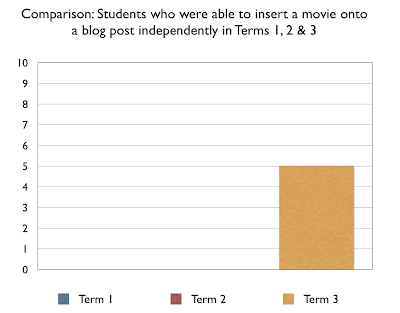 If there was a unit on movie making then all students would be able to upload movies of themselves onto their blogs. Also the creating of movies has a lot more steps such as: making the actual movie, editing the clips, uploading them onto Vimeo and copying and pasting the embed code onto the blog. 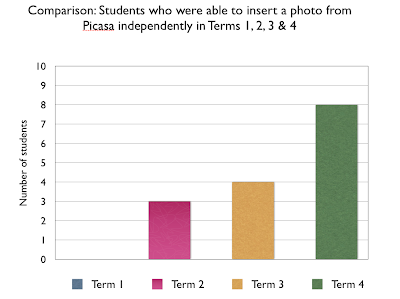 Over time students have been able to insert photographs from Picasa onto their blogs independently. This is due to that all photographs from classroom activities and outings were uploaded onto Picasa, so that the students were able to view them and choose the photographs they liked and matched their learning onto their blogs. There has been shift with the students being able to upload a picture from the internet onto their blogs. 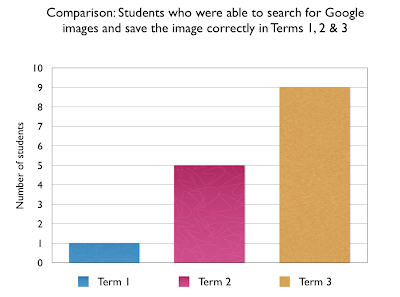 Students use Google Images for learning and to enhance their content that they have researched. Adding an image makes the learning real for them especially if it was a historical / past event or focus. Term 4 students have discovered the webcam. We have not had specific lessons in using the webcam, as we have had technical issues with the webcam. The older devices have different settings and may not always work. Java, Flash and Adobe are the issues when we try and use the webcam. We have abandoned the idea in using the webcam for the time being. Also with a class of 30 students it was much easier if we did not use it, because of limited space within the school. 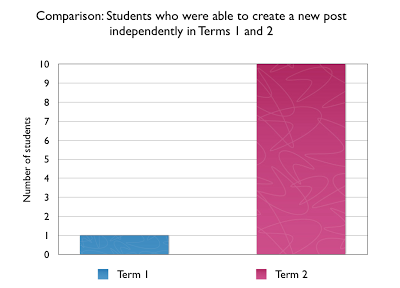 In term 2 students could see the purpose in taking a screen shot of their learning. This has been consistent throughout the year. 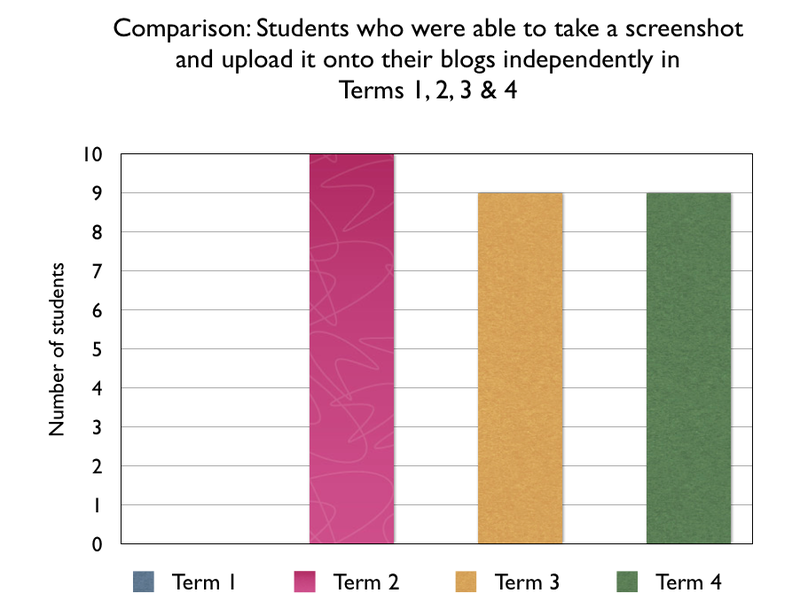 In Maths Whizz and Xtra Maths students would regularly take screen shots of their progress and write reflections on their blogs. Taking screenshots of learning was a regular occurrence in the classroom . In term 1, some of the students were familiar in commenting to others as they did this the previous year. At the beginning of the year all of the class were taught about what a comment is and making constructive comments. Making comments to each other, classes at Panmure Bridge School and to schools within the cluster. 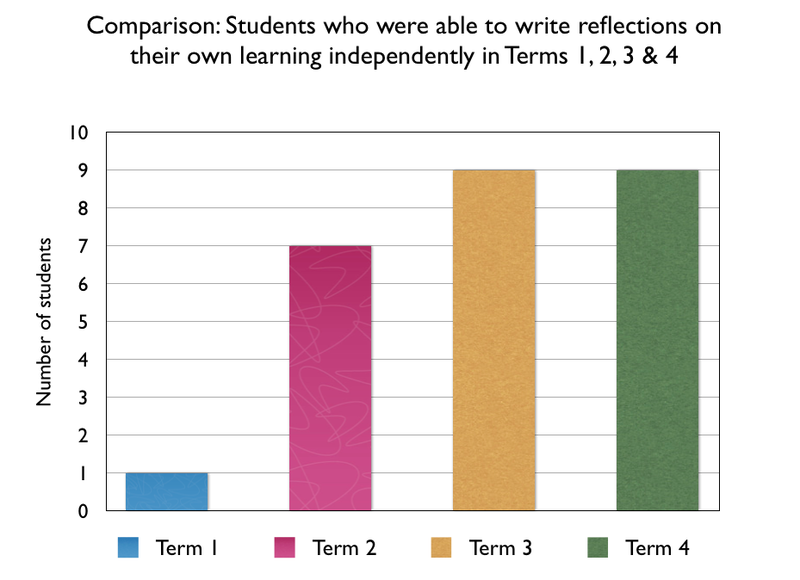 There has been an increase since the beginning of term 2 of students being able to write reflections on their own learning. 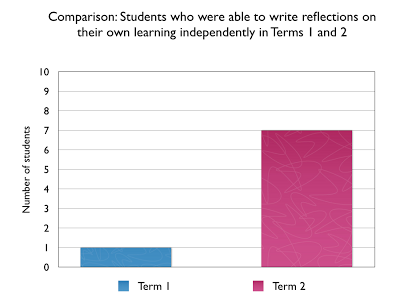 Reflecting has been a critical part to the learning programme in Room 5. On the wall their are plenary questions to assist students with self evaluating their own progress. Writing reflections is often modeled by the teacher, so that reflections are in depth and can address the next learning steps. Students have made a great effort with clicking onto hyper linked book marked websites. This has been evident with the Inquiry / Topic work that the students do in class. The class site has bookmarked websites that the students can access under the Topic tab. This makes it easier for the students, as they can click onto a picture which is hyperlinked to a child friendly website that is at the child's level of understanding. Throughout the year have gained knowledge and experience with using Wall wisher, Popplet and Lucid Charts. This has happened more in Inquiry Learning, where students can brainstorm information, compare and contrast information and present information. Students can choose an application that they wish to brainstorm information onto. Popplet seems to be a favourite within the target group as they can create mindmaps, insert images, colour code and upload You Tube clips onto their work. 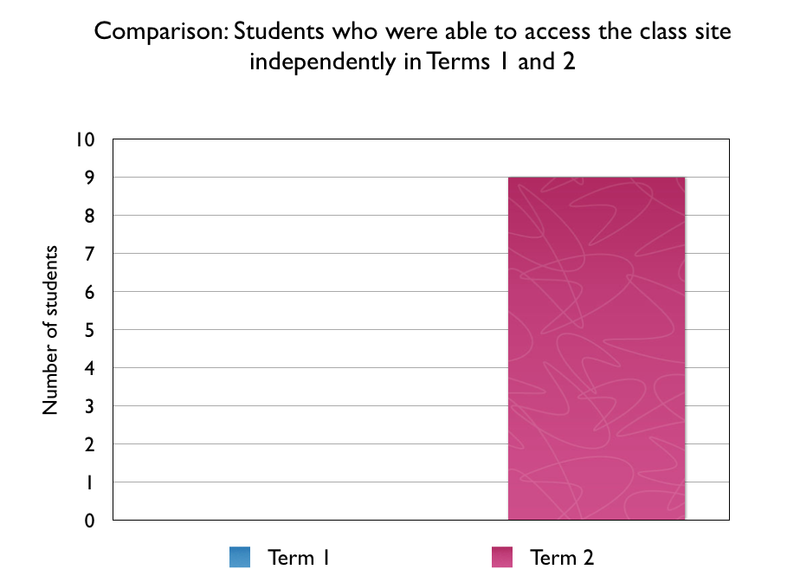 Term 2, was the time in which students were able to access the class site independently without the support from others. The Year 6 students whom I taught as Year 5's had the greatest familiarity with the class site from the year before, so their learning was transparent and their knowledge could be passed onto the Year 5 students in term 1. This has been an ongoing process for the students. Those who are confident readers and writers seemed to take risks with using Google search engines. There is so much information out there that for students who struggle with reading and comprehension, it can be overwhelming and off putting. Putting content from the internet has been an ongoing goal. 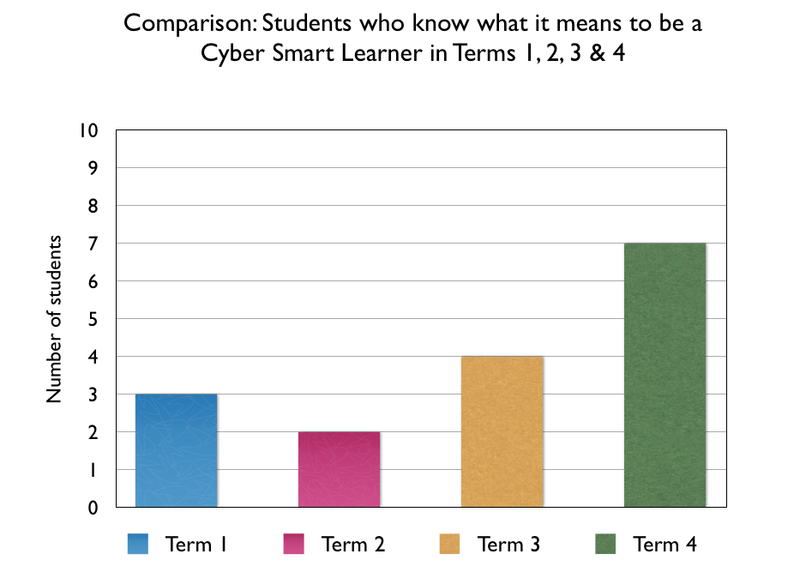 It is hard for a lot of students as the information on the internet is pitched at a much higher reading level than what these students are working. We have had lessons on reading articles from a number of sources and then putting the information into our own words. It has been a challenge but valuable learning. 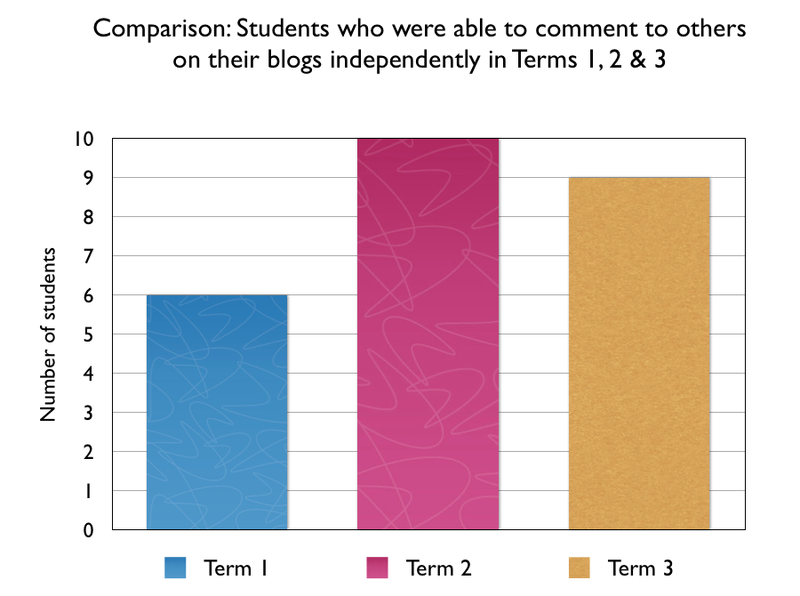 There were shifts from term 1 through to term 2 on students who were able to visit the class blog independently. In term 1, the students were finding their own way around with their device. They were taught how to access their individual blog from the class blog and were shown where to view other students blogs from the class blog. Over time the class blog was viewed more by the students as they were keen to see whose work has gone onto the blog, whose up to date with their learning and who needed to spend their time wisely to get work finished. 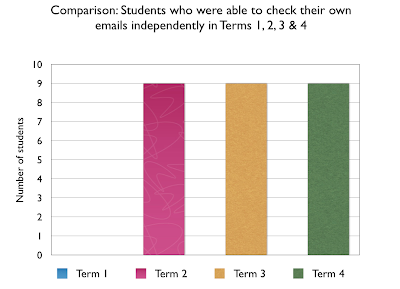 Students can now check emails independently. Through using Picasa album invites were sent to the students via email. 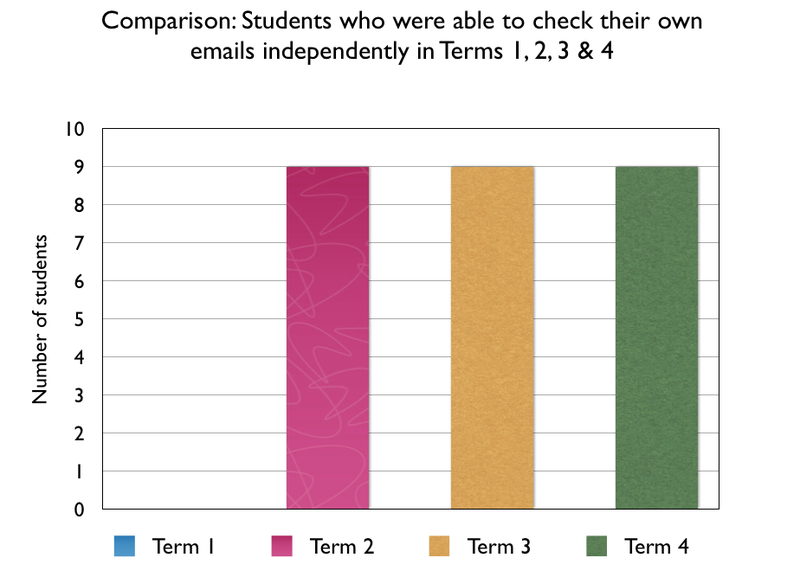 This gave students the incentive to check their emails regularly. Also every week I would screen shot each child's weekly Maths Whizz results to them and so this gave the students opportunity to check their emails. Searching for images became much more frequent throughout the year. In the first term, only one student knew how to do this. 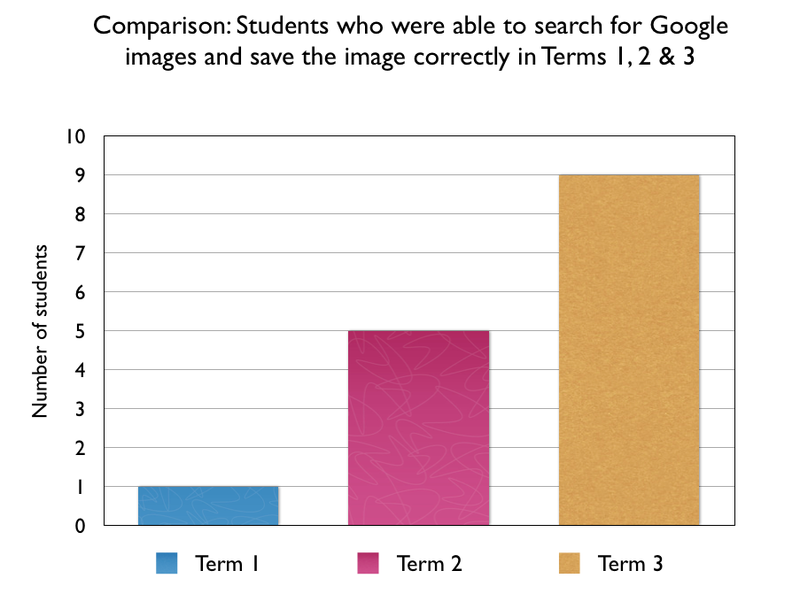 Over time progress had increased with students being able to search and save Google images independently. 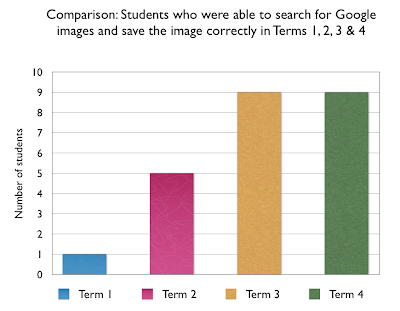 Students tended to search for images during Inquiry / Topic lessons than in any other subject area. 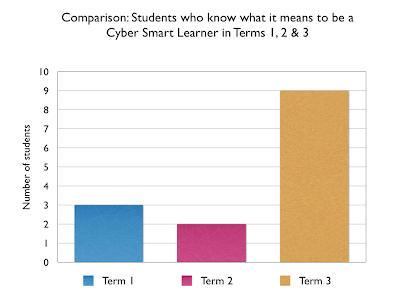 Over time students have developed knowledge around being Cyber Smart Learners. This is still work in progress. Students understand the legalities of setting up accounts and the legal ages in doing this. They have gained an understanding of the term plagiarism and the importance of putting information into their own words. They have also learnt about being safe around advertising and not to believe in everything they see or read on the internet. This term I have been working on building partnerships with the Year 4 class. 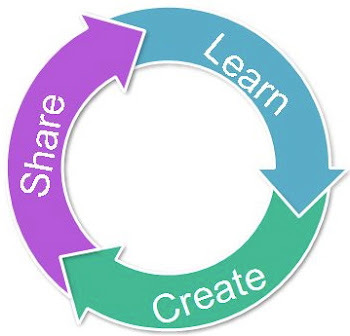 I have been very proactive in my approach, focusing on setting up the year 4 students for success when they enter into a 1:1 digital learning environment in 2014. The first thing I did was speak to their classroom teacher around creating blogs for each student. It has been an exciting process. Their classroom teacher gave me a list of her top students that she wanted me to work with. She believed that if I worked with the top students then their new knowledge and skills would be passed down onto the others. At the start of the term I created blogs for the entire class. From there I would work with groups to accept their blog invites and to create a new post onto their blogs. The experience has been amazing as some of these students learn the technical skills fast and apply them back in class. 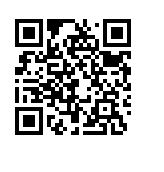 All of the student blogs are hyperlinked back to the class blog. Click on the links below to view the student blogs. This video was a recommendation by my Year 6 students on ways I could assist the new Year 5's or new students when they enter into a 1:1 digital learning environment. The Year 6 students were interviewed earlier on in the year and they felt an orientation movie would help new year 5 students or any new students in gaining an understanding on what was required when they become eligible Netbook / Chrome Book users. There will be a number of orientation movies made next term on Being a Blogger, Looking after the Chrome Book at school and at home and other requirements. This video is on Becoming a Google Account holder. We hope you enjoy it. Orientation movie1 from Joy Paton on Vimeo. It is evident that all the children in the target can now log into their netbooks independently. 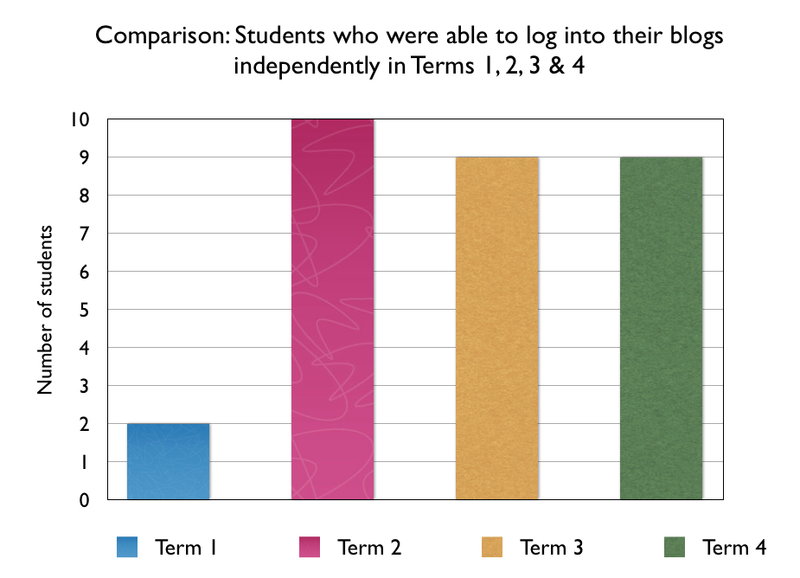 At the beginning of term 1, zero students could not do this, but through plenty of practice and opportunities to use their device every day they now log into their netbooks. 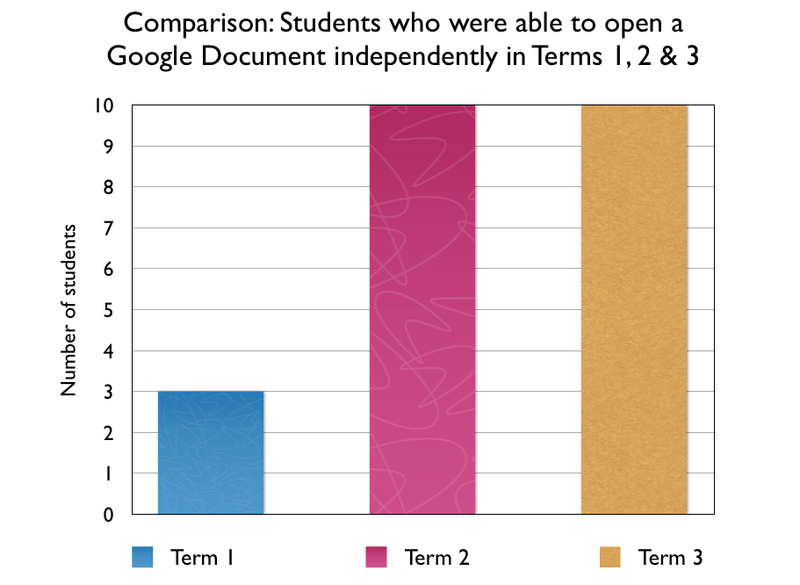 The skill in opening a Google Document independently was achieved in Term 2 and this has carried on in Term 3. The knowledge and skills of filing work under the: Reading, Writing, Maths and Inquiry folders has continued in Term 3. The students made the most progress between terms 1 and 2. 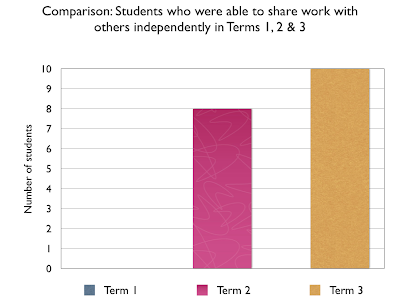 In Term 3, the students made the most progress in being able to share their work with others. 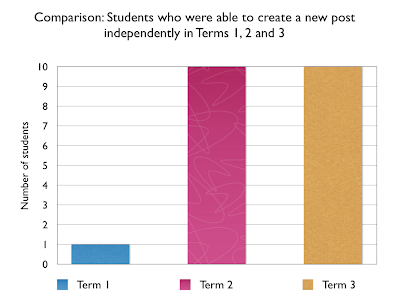 Early term 1, the students did not have the experience to share their work with others, but over time their skills have improved. In Term 3, eight students were able to use Google Spreadsheets independently. 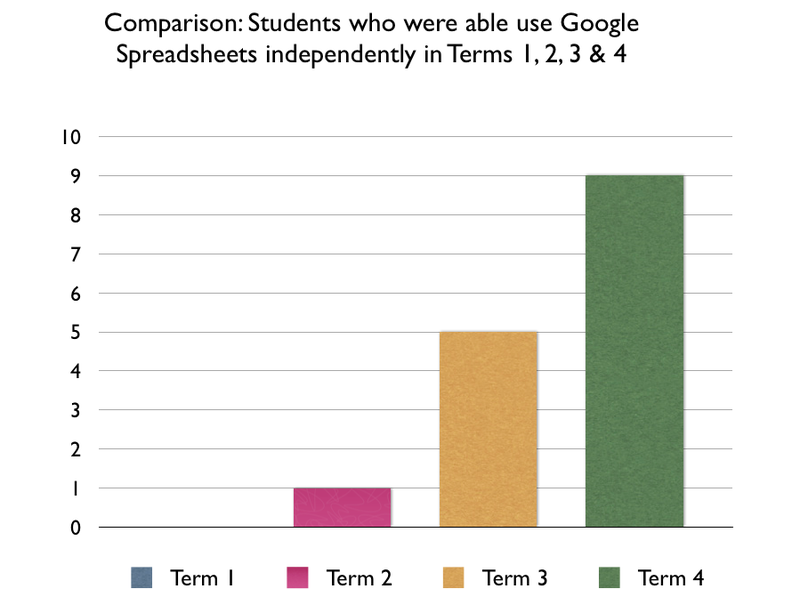 This might be due to my Release Teacher using Google Spreadsheets on my class once a week to gather performance data on their Current Events knowledge. All of the students within my target group are able to use Google Draw independently. 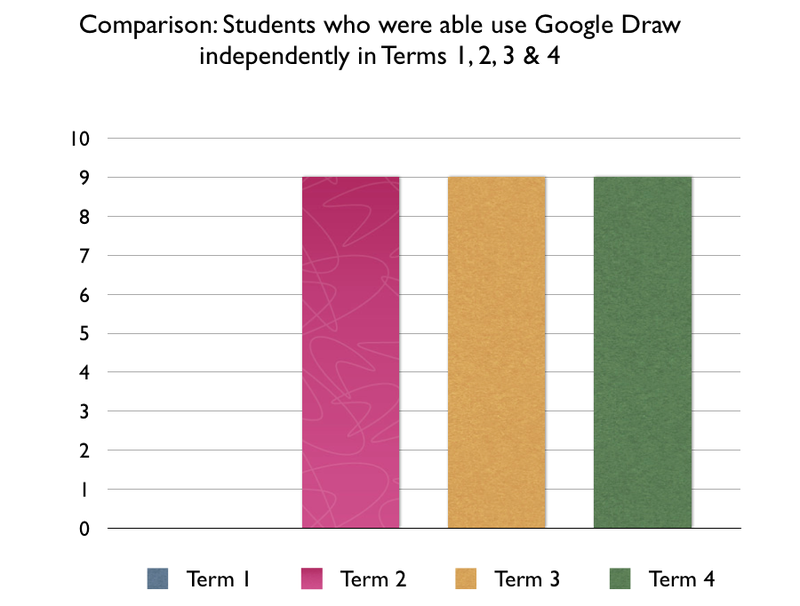 This might be due to using Google Draw in Mathematics to show understandings of concepts such as Fractions and Place Value. 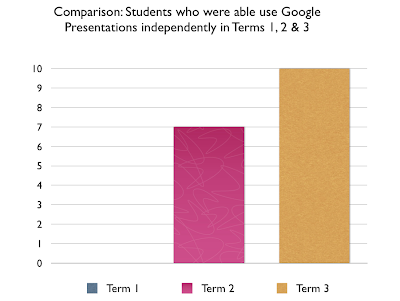 The ten students in my target group are now able to use Google Presentations independently. This might be due to the students having more exposure in using Google Presentation for Inquiry, Mathematics and Homework. 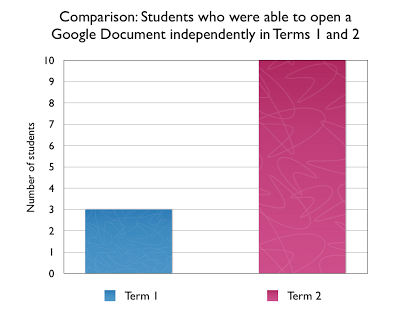 There has been gradual progress in students being able to embed these applications independently. More work needs to be done to ensure all the ten students are able to do this confidently. All of the ten students are able to do this skill independently. Every day these students log into their blogs and post their work. It is clearly evident that the target group of ten students are able to create new posts independently on their individual blogs. There is an expectation that they are to publish five pieces of learning up on their individual blogs every week. All of the target group of students are able to insert photographs onto their individual blogs. The students have had plenty of opportunities to insert photographs onto their blogs through screenshots and photograph album links emailed to them. This skill is used regularly throughout the curriculum areas. 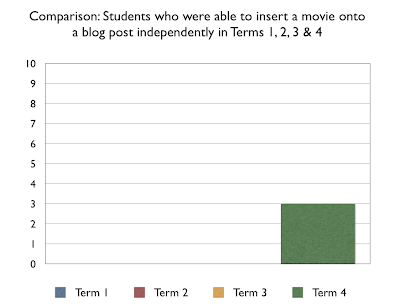 This is pleasing progress with five students able to insert a Vimeo embed code of a movie into a blog post. However, more work needs to be done on this. 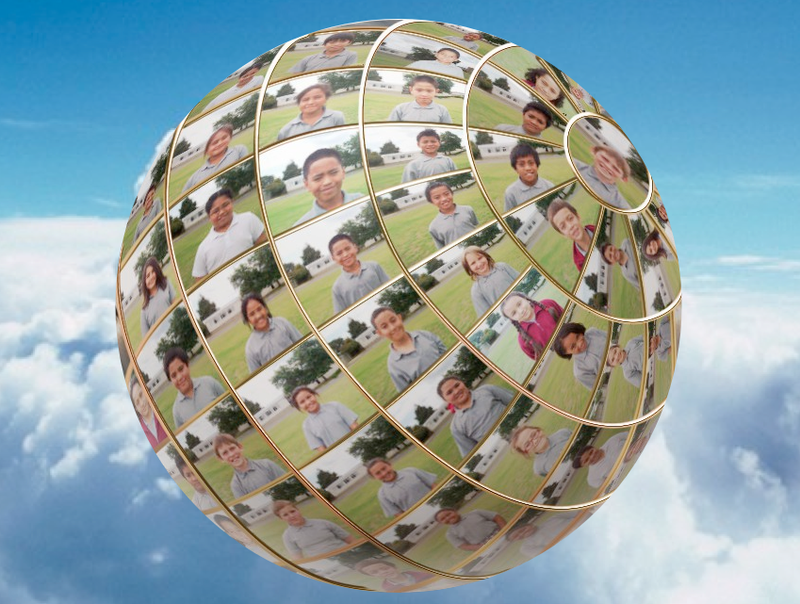 There has been excellent progress between terms 2 and 3 with inserting a photograph from Picasa onto their blogs. Further teacher modelling needs to be done to ensure all students in the target can insert a photo from Picasa onto their blogs. There has been some progress made with students being able to save a photograph from the internet and upload it onto their blogs. 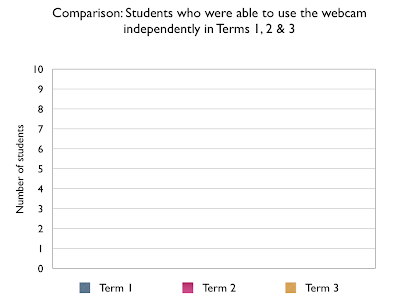 There has been an increase because in term 2 students had to make presentations and flipping eBooks on Past, Present and Future Education. This term they have had the opportunity to create special effect pictures using land form pictures, so there were lots of opportunities to put this skill into practice. Using a webcam hasn't been a priority during these last three terms. It is difficult with 32 students in the class to use it. I think if we had more space where students could work quietly it maybe used more often in the classroom. This skill was achieved in Term 2 and has carried through into Term 3. Students take screen shots in the curriculum areas. One of the areas students take screen shots is Maths. They regularly take screen shots of their progress in Maths Whizz and Xtra Maths. They also write reflections on their learning underneath. There has been a decrease in term 3 from ten students being able to make comments independently to only nine students being able to make comments independently. There has been excellent progress made with students being able to write their own reflections on their own learning. 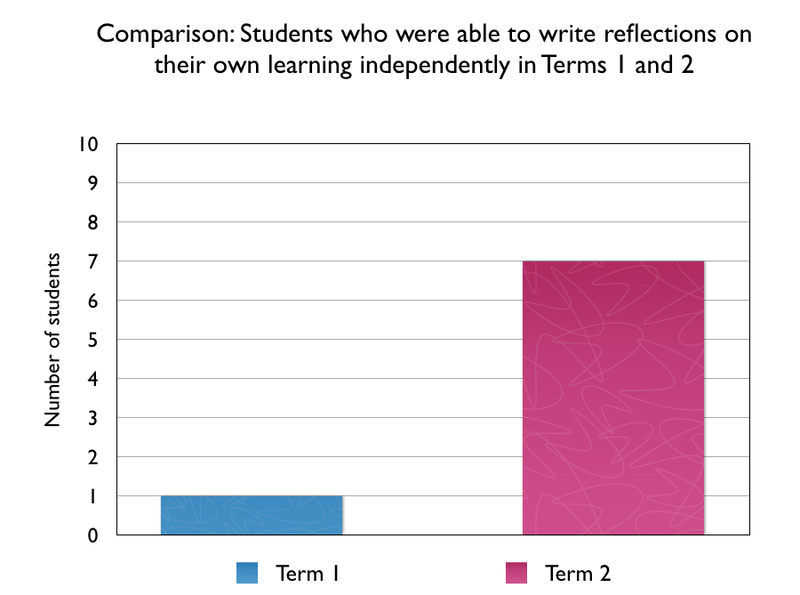 Students have had opportunities to write reflection more throughout the year, as they have had Math Whizz weekly results emailed to them, they also take screen shots of their Xtra Maths progress and when we complete any form of art, the students always write a reflections on how well they did. Throughout the year, the students have had plenty of opportunities to reflect on their own learning. 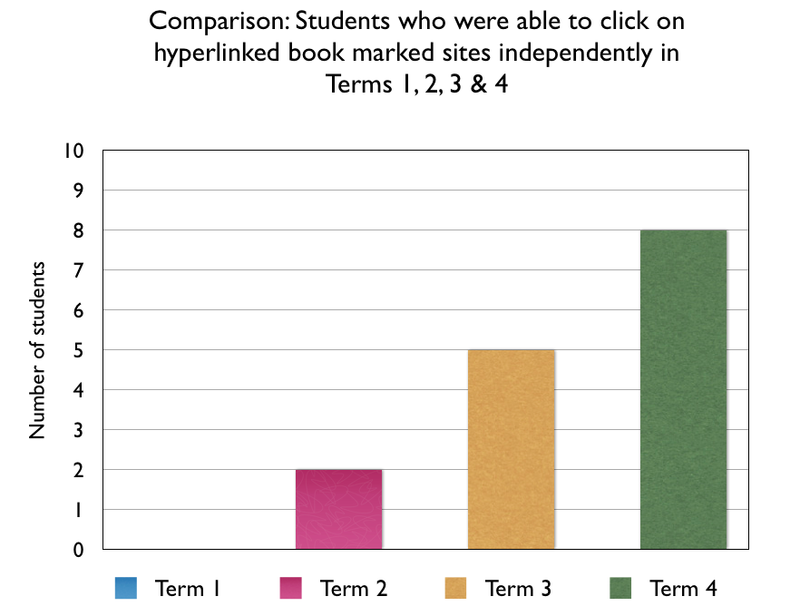 There has been some progress made on students being able to click on bookmarked hyper linked websites. They students can access this book marked sites through the class site. I think the terminology of the word hyperlinked hasn't been explained to the students or class which has resulted in eight out of ten students being able to do this. They naturally do it, when they are on the class site especially when they click on the Topic tab. 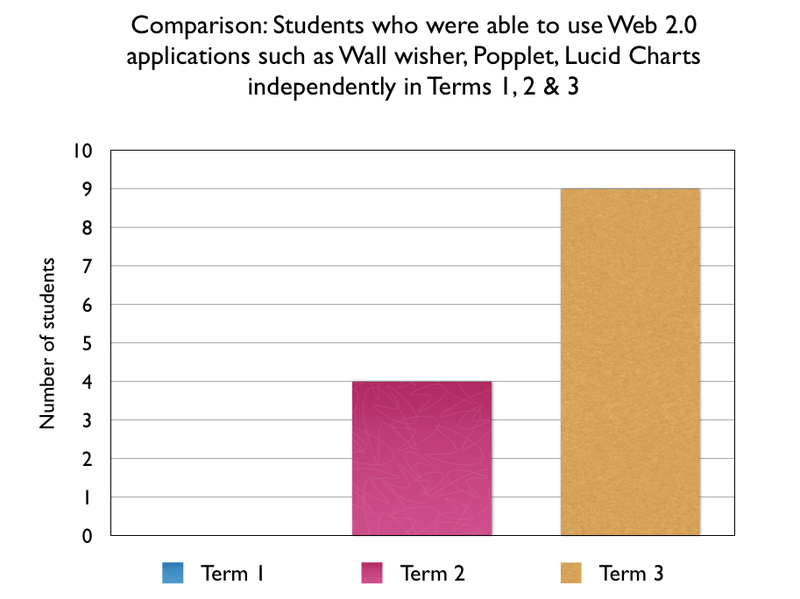 There has been an increase of students being able to use these Web 2.0 applications independently in term 3. There has been a shift between terms 2 & 3. Towards the end of term 2, the students were taught how to use Lucid Charts to make Venn Diagrams. Throughout the year, the students have continually used Popplet. Wall wisher has been used occasionally, but Popplet has been a favourite application to use, as students can embed You Tube clips, images, colour code ideas. Only nine out of ten students can access the class site. The one student who could not access the class site has a poor level of attendance and his ability is very low. 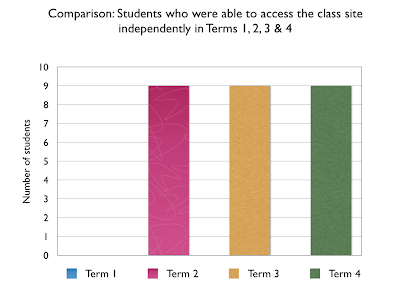 More work in term 4 will be done to ensure he can access the class site independently. 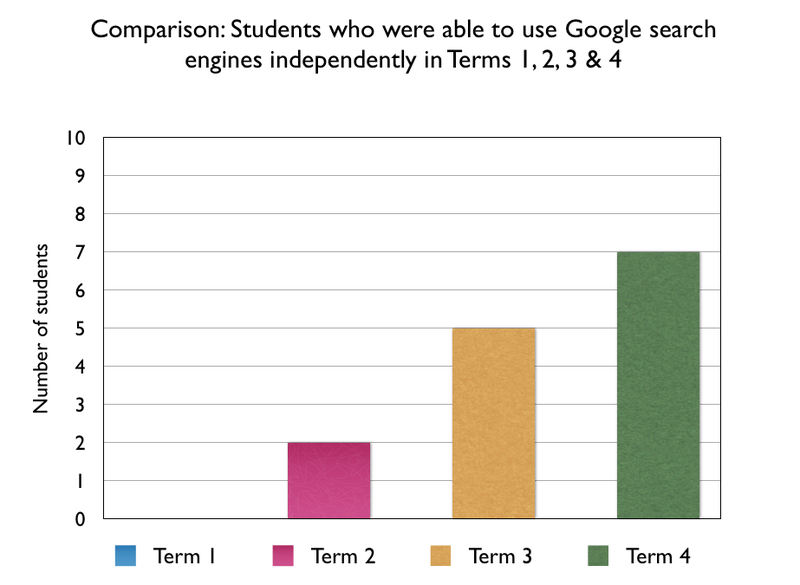 Only five out of ten students can use Google search engines independently. This is due to the teacher having book marked sites for students to visit on the class site. Students have not had opportunities to use Google search engines because a lot of the content on the web is very advanced that when I go on the internet and book mark sites I find websites that the content is at the students level. There has been some progress made across the terms in being able to put content from the web into their own words. More work needs to be done on this. In term 3, there were a number of lessons where I read about what geysers were from a number of sites. As a whole class the students had to summarise what a geyser was. There has been steady progress made with students being able to access the class blog independently. 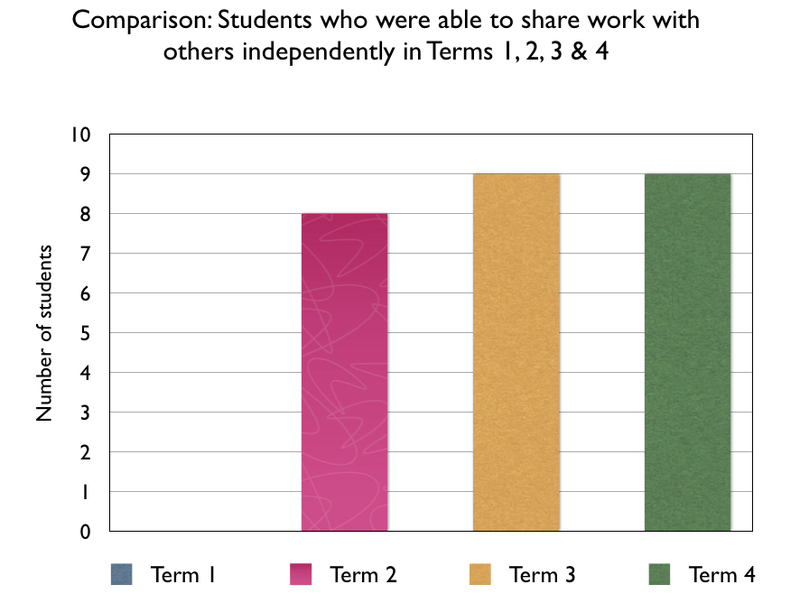 There still needs to be more work done in meeting this skill as nine out of ten students were able to do this independently in term 3. The one student who could not access the class blog independently is the same student who has had a lot of time off school. There has been a shift in students being able to watch You Tube video's independently. During term 3, students have done inquiry research on a landform on their choice. You Tube has been encouraged as there is advanced scientific texts on landforms that students would find difficult to understand. Through using You Tube, land forms are explained to the students in a visual format with maybe some animation which would assist them to write reports on their chosen landforms. There has been great progress with students being able to search for Google images and save them correctly. Throughout the year students have been able to search for images and save them correctly. This has happened more with inquiry topics. In Terms 2 & 3 students have made presentations on Education - Past, Present and Future and Landforms. They have had to search for real images to enhance their presentation. This is pleasing progress. There have been planned lessons on Smart media, Building smart relationships and Smart Surfing. The remote control on the teacher dashboard has enabled the teacher to view tabs and sites that are open so that students remain safe. Lessons on summarizing content into own words has been taught so that students are not plagiarizing somebody else's work. Cyber Safety is still an ongoing area that needs to be developed further. This is very pleasing. The target group know how to care for their Netbook / Chrome book. Over half the target group have had their parents come in and do a training workshop with Courtney and they have been eligible to take their devices home. So far we have had no breakages from these students, which is pleasing. This is presentation of my current research I am doing for the Manaiakalani Innovative Teachers Academy. It is work in progress. This presentation is based around the Teacher as the Inquirer model. At the beginning of term 1, there were not any students who could log into their netbooks without the support from other students. 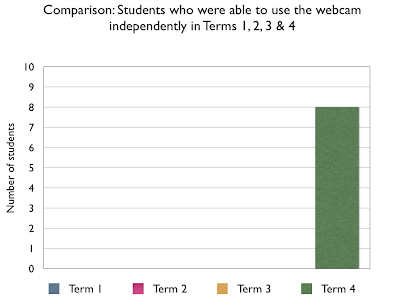 This might have been due to students not having a netbook during the time of being interviewed. In term 2, nine out of ten students were able to log into their netbooks independently. One out ten students could not as her parent has recently signed up for a Chrome Book and at the time of initially setting her up with her Chrome Book, we found out that we have run out of licenses. This problem is being addressed and when she is questioned in term 3, she would be able to log into her Chrome book independently. 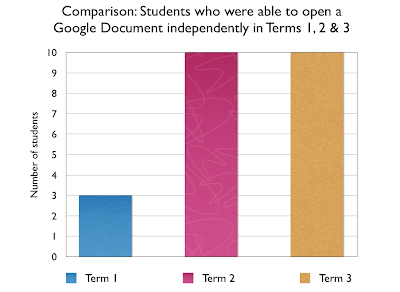 In term 2, ten out of ten students are able to open a Google Document independently. 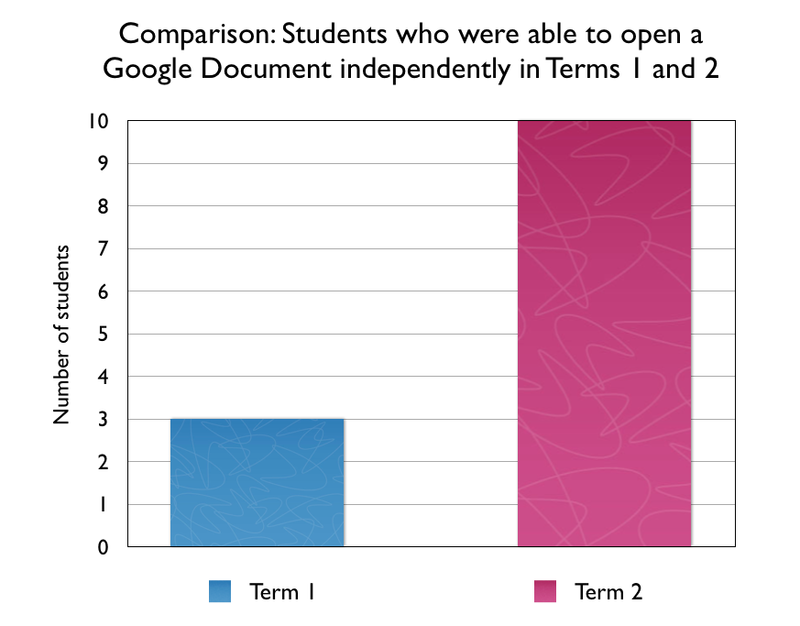 At the start of term 1, only three students could open a Google Document independently. This goes to show that it is important to run an orientation programme for the new upcoming Year 5 students who are currently in Year 4, in learning to use Google Applications and other digital tools. 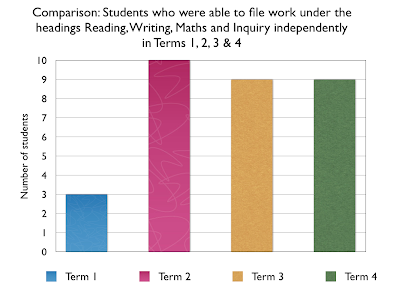 In term 2, there are ten out of ten students who know how to file their learning under the folders: Reading, Writing, Maths and Inquiry. This is an improvement, compared to term 1 where only three out ten students could do this independently. One of the variables could be that those three students could have had more practice opportunities at filing work, as their parents could signed up for netbooks / Chrome books earlier than the other students. At the start of Term 1, only two out ten students could log into their blogs independently. 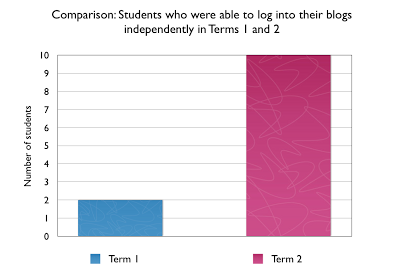 Over time there has been an increase within the number of students who are now able to log into their blogs independently, without the support from other students. At the beginning of term 1 only one student could create a blog post independently. At the start of term 2, all ten students were able to do this. This is down to students having a netbook to use and having maximum practice opportunities to fulfil this requirement. 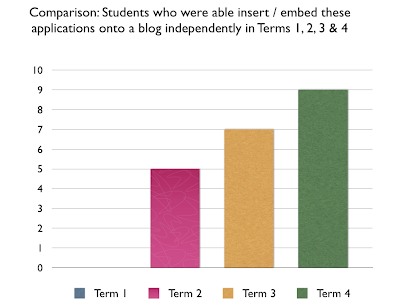 At the start of the year, the upcoming Year 5 students did not know how to fill out the blog post requirements. This is due to the class blog being managed and administered by the teacher last year. Since the students have entered into their new digital learning learning environment they are the authors to their own individual and have learnt very quickly how to fill out the blog post requirements. At the start of the year students did not know how to insert a photograph onto their blogs. 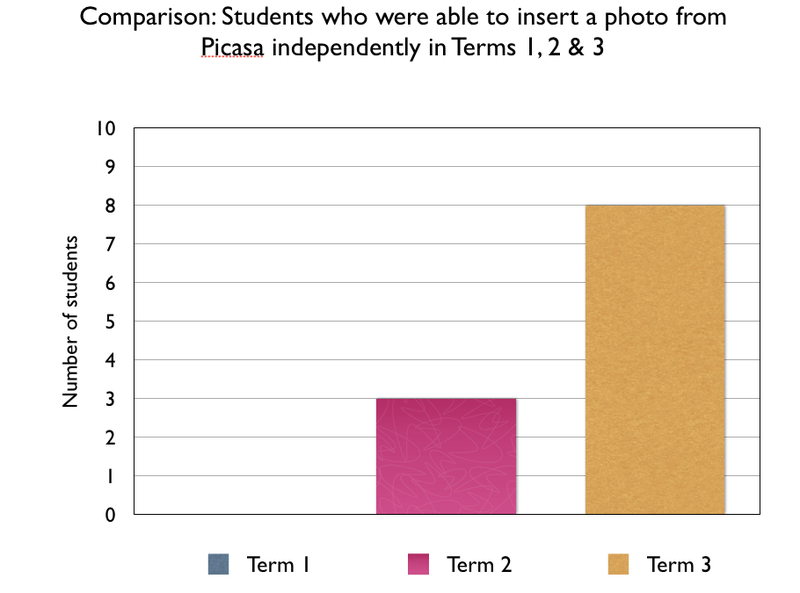 In term two, nine out of ten students can insert photographs independently. 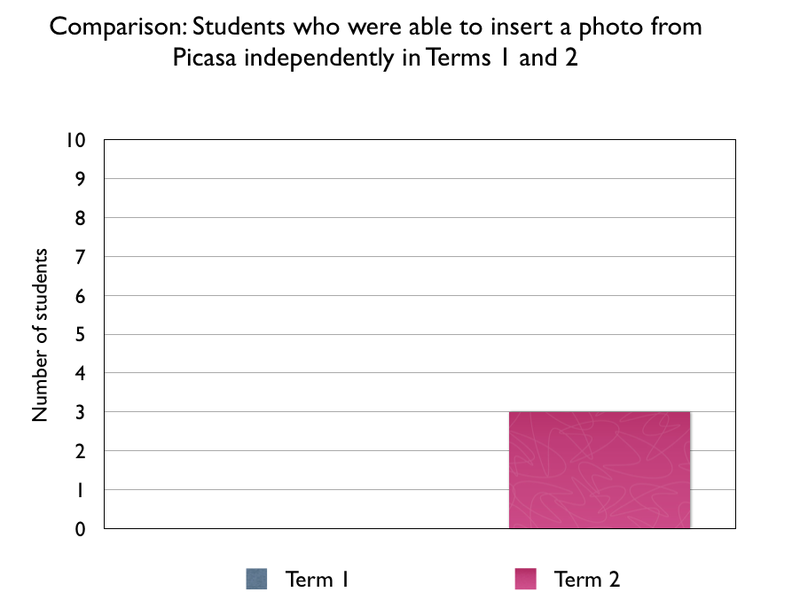 One of the reasons for the increase is that photographs of student learning are taken regularly and are either emailed to the student or put on Picasa for the student to access. 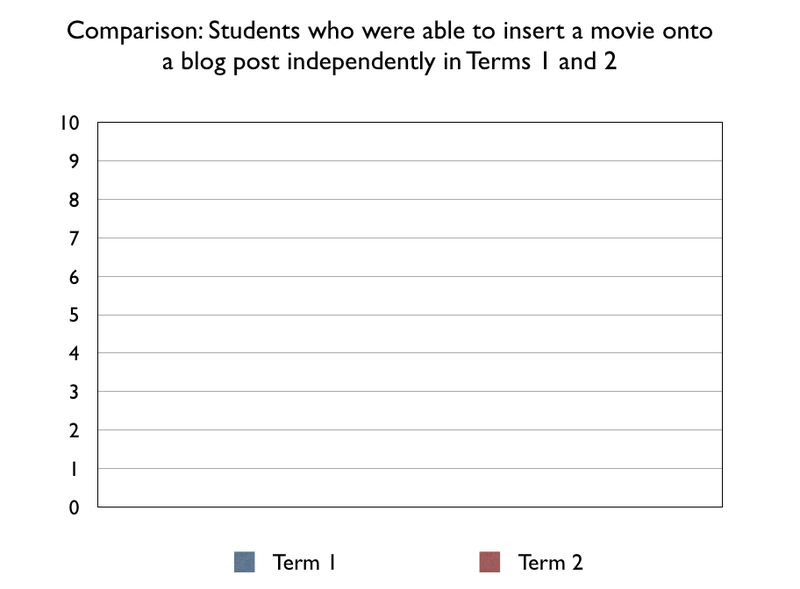 In Term 1, children were only exposed to movie making once. They were filmed on their Inquiry Learning presentations. Each movie went through Vimeo and the embed code was emailed to them. As this was a gradual process, not all students were taught this. Also the Teacher's laptop's hard drive failed in the midst of this process and the laptop was sent away. This is a goal for term 2. In term 1, zero out of ten students could not independently insert a photograph from Picasa onto their blogs. Three out of ten students are now able to do this independently. This could be due to that a lot of photographs were taken from my iPad and were emailed to students individually, while my laptop was being serviced. Last term students were only given 2-3 opportunities to access class photographs from Picasa. 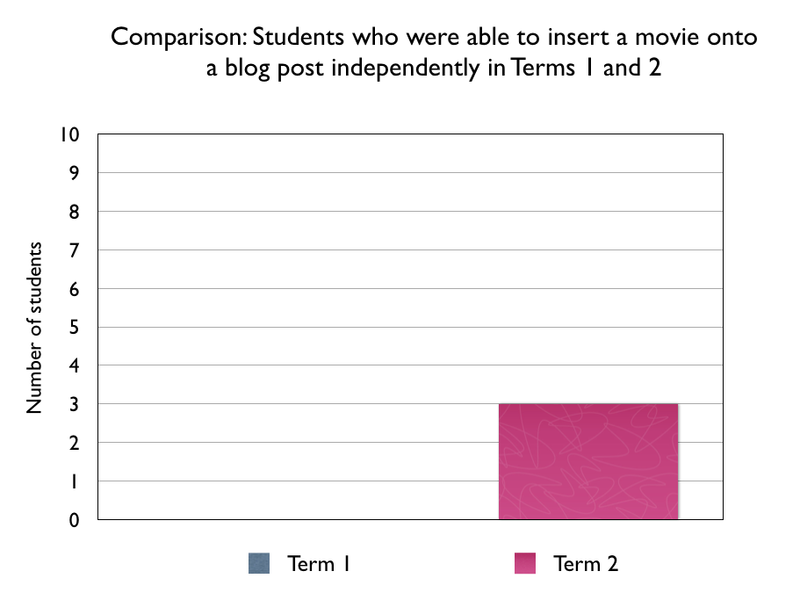 In term 1, there were not any students who could insert movies independently onto their blogs. In term 2, only three students could do this. This is due to the fact that these students have only had one practice opportunity to do this. 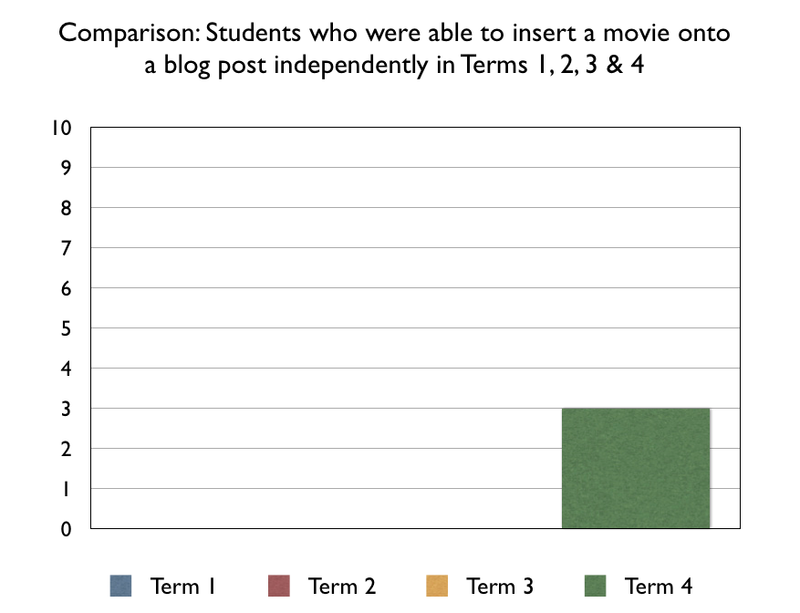 Further work needs to be done to ensure every students can insert movies independently onto their blogs. 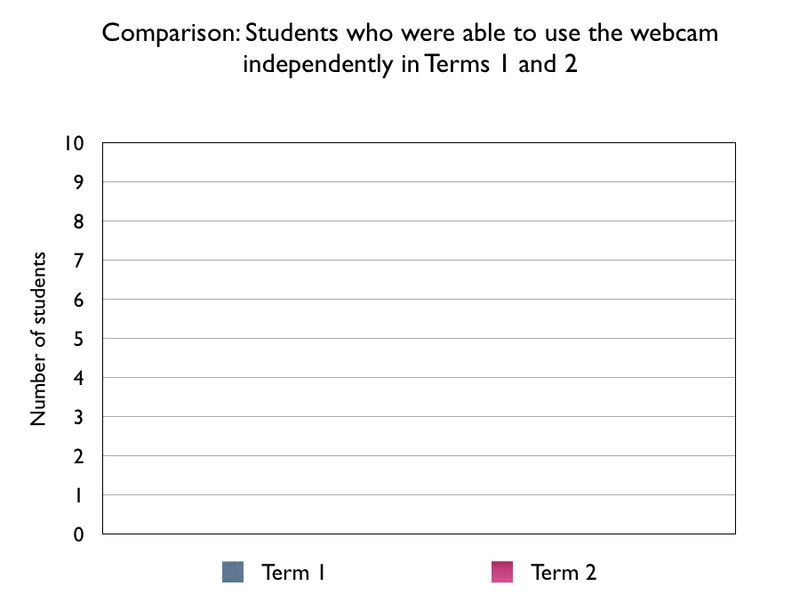 Last term, there wasn't a need for students to use their webcams on their netbooks. The webcam works well if the students were in a quiet room. It is awkward when there are other 33 students in the class. 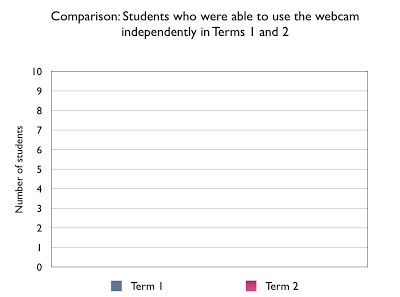 Hopefully this term students would be able to use their webcams without any uploading issues. At the beginning of term 1, there weren't any students who could take a screenshot independently and upload it onto their blogs. 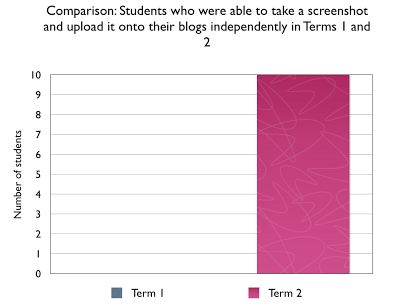 In term 2, ten out of ten students are now able to take a screenshot and upload it onto their blogs. During the term, students have been enrolled to do online programmes such as Study Ladder, Maths Whizz and Xtra Maths. These students have been encouraged to take screen shots of their progress and to upload it onto their blogs and to write a reflective statement. 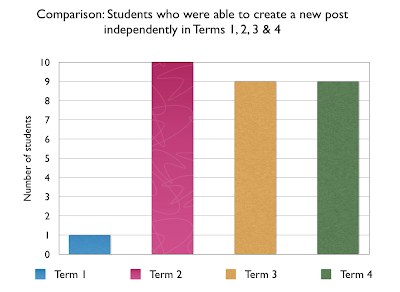 In term 1, only six students were able to comment to others. This was due to having some experience in online commenting last year. In term 2, ten out ten students were able to comment to others. This is due to students being given practice opportunities. Making comments to others is used as independent learning activity for when I am working with groups in Reading and is used as a homework task to comment on the blog of the week assembly item. 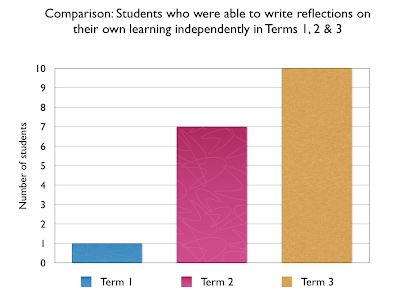 At the start of term 1, only one student was able to reflect on their own learning. Since then students have been given opportunities to critically reflect in Art, Topic and in Maths. In term 1, the students had no experience in using hyperlinked websites. 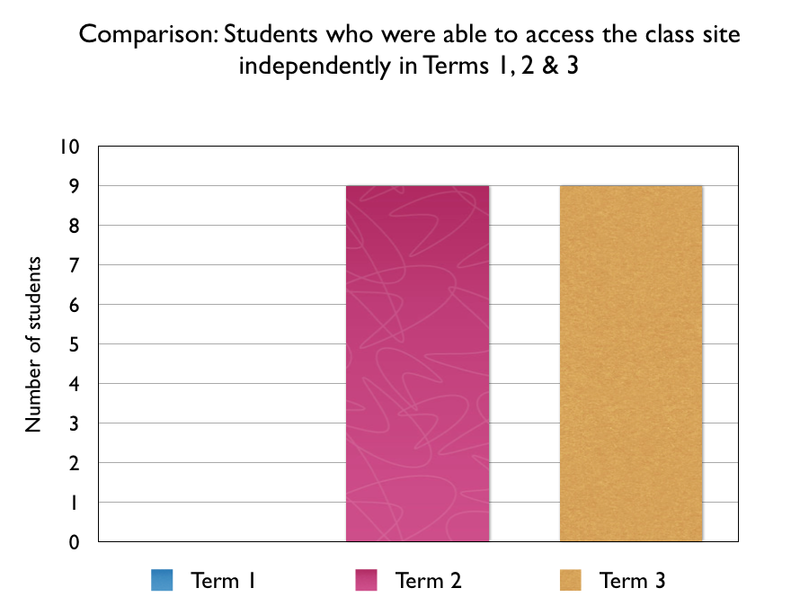 In term 2, only two students claim that they could do this independently. As a teacher, I know they have all had experience clicking on hyperlinked sites from my class site, yet this has not been emphasized to them. I feel I need to explain more to them what hyperlinking is and perhaps getting them to create a hyperlink on one of their blog posts. Seeing is believing and there's nothing like breaking the language down for them. At the start of term 1, there were not any students who had experience using Wall wisher, Popplet and Lucid charts. Therefore they could not use these applications independently. 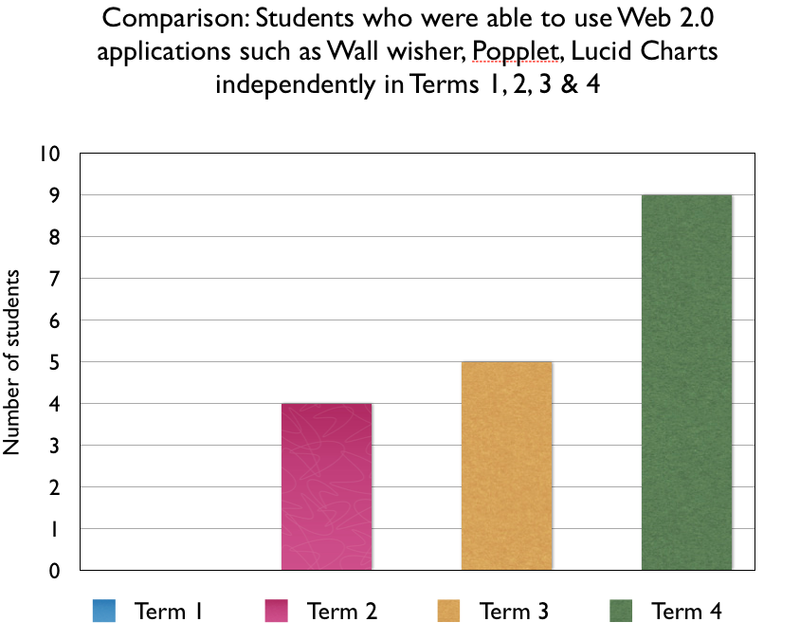 At the start of term 2, only four students could use Popplet, Wallwisher and Lucid charts independently. More work needs to be done in this area. 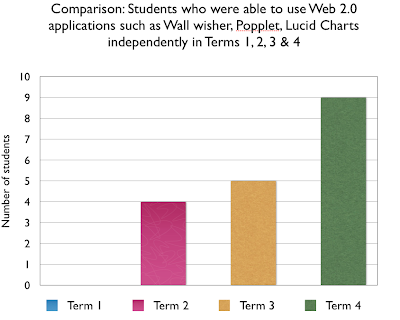 When these web 2.0 tools were demonstrated in term 1, not all of these students had signed up to their netbooks or Chrome Books which delayed learning. If they were to use the class computers they would then be grouped and normally one person within the group would take over the learning leaving the other member with very little hands on learning. At the start of term 1, there weren't any students who could access the class site. Through showing the class where to go, nine out ten students are able to access the class site. The class site is being used more and more, for students to access reading follow up work, maths links, reflection activities and homework tasks. In term 1, there were not any students who could use Google search engines. 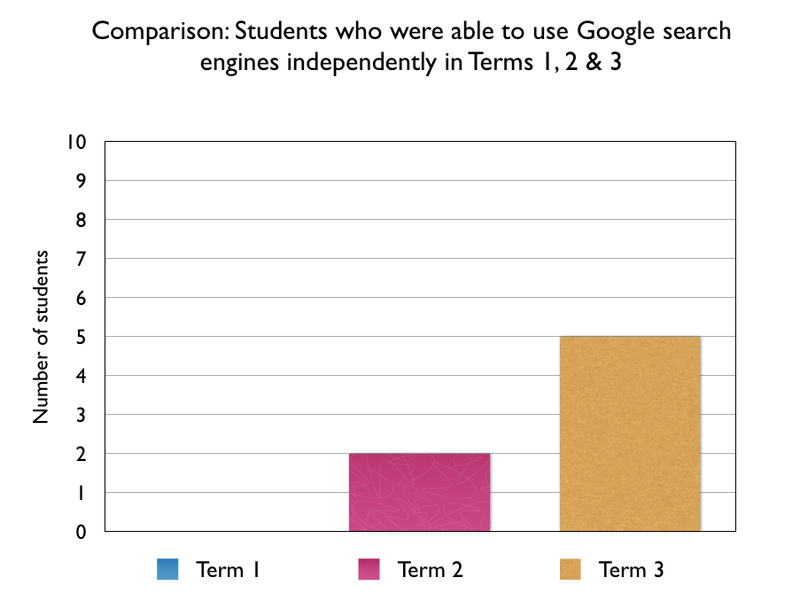 In term 2, only two students were able to use Google search engines. There are many variables to this. I think the main variable is that I tend to create hyperlinked pages for students to access specific web sites on my class site. My reason for this is that I want students to be able to access content which they would be able to read and understand. Last term, we studied war and conflict. If I got my class to search World War 1, they would find content that would be above their understanding. This would lose a lot of class time and the internet is so broad that it would like giving my children a million books to look at on this subject. In term 1, only one student could do this and in term 2, only two students could do this. This is an ongoing goal and is work in progress. 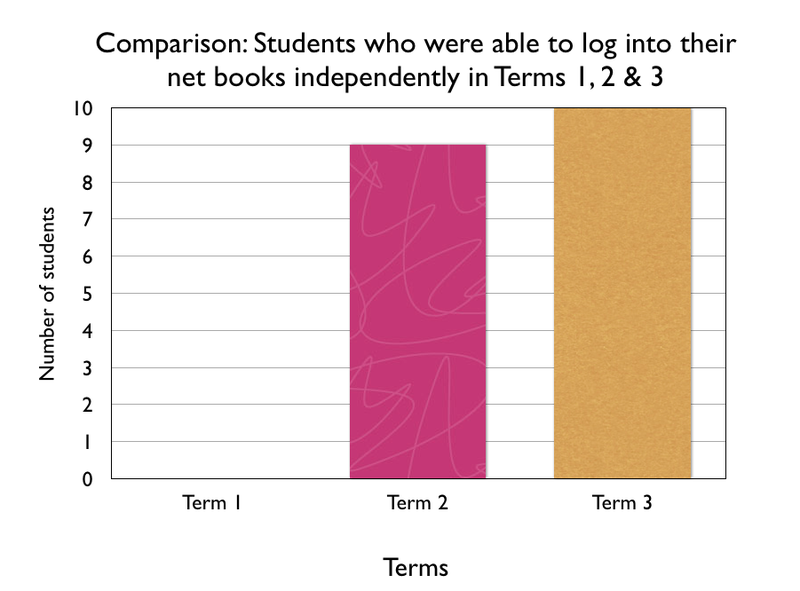 At times the content off the net is not at the students reading age level, which makes it challenging for the students to understand the main ideas. This goal is also tied into the guided reading program, where students are taught to summarize passages of a text and are encouraged to retell texts in their own words. 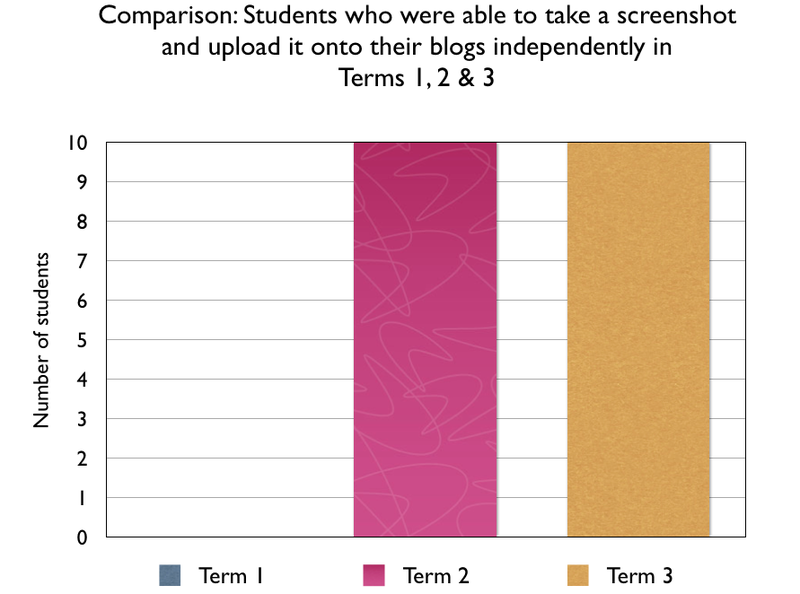 At the start of term 1, only one student could access their individual blog at home or anywhere. In term 2, only five students could do this independently. 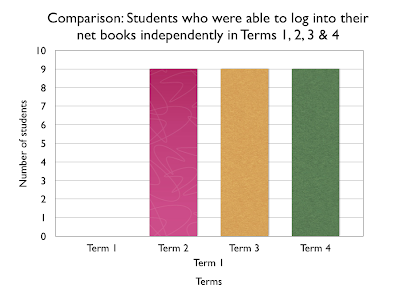 One of the variables that need to be taken into consideration is those who are eligible to take their netbooks home. Those year 5 students who are eligible would have more practice opportunities with accessing their individual blogs after hours than those who are ineligible. Also another variable would be whether the five students who were interviewed have internet access at home. If they do then this would also make a difference students would be able to show their parents their individual blogs and updates more regularly. 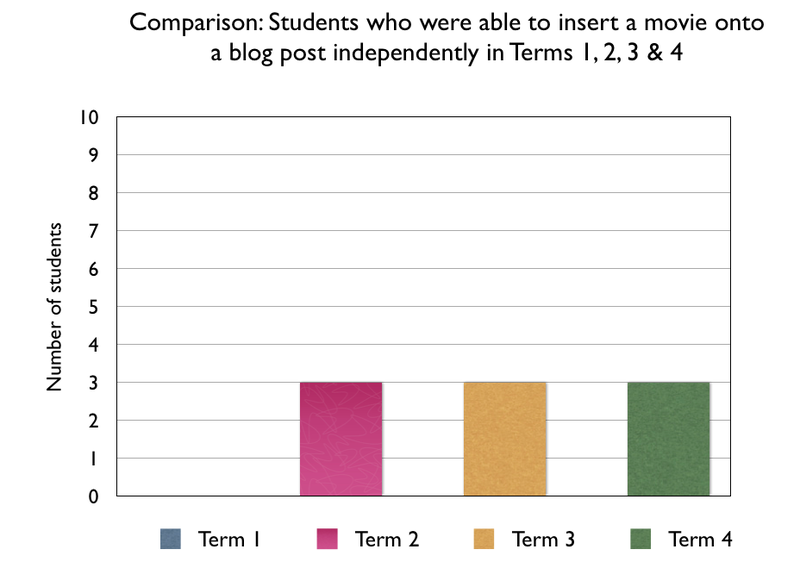 At the start of term 1, only six student were able to visit the class blog independently. 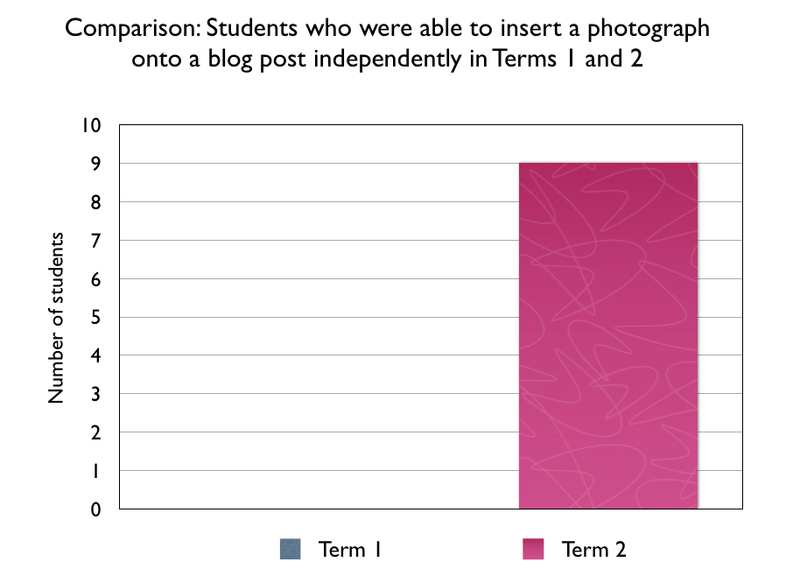 A reason for this is that some of the Year 5 students were taught by me as Year 2's and worked from the same blog. Also the blog is shared in blog of the week presentation in assemblies. In term 2, ten out of ten could visit the class independently. 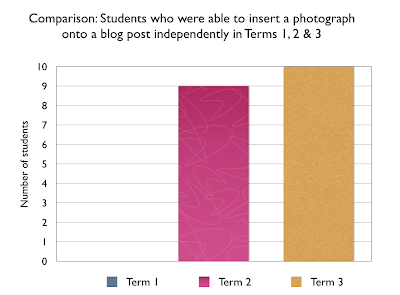 This might be due to students work being uploaded onto the class blog every week. Also a lot of the photographs of whole class activities are made into presentations and are uploaded onto the class blog, which makes it a fun site to visit. In the beginning of term one there were not any students who could check their emails independently. In term 2, nine out ten students could check their emails independently. During this last term, students have had Maths Whizz progress photographs emailed to them, Maths photos emailed to them and art photo's emailed to them. Students have had plenty of practice opportunities to access their emails and to upload email content onto their blogs. This was a very interesting response I got from the students. 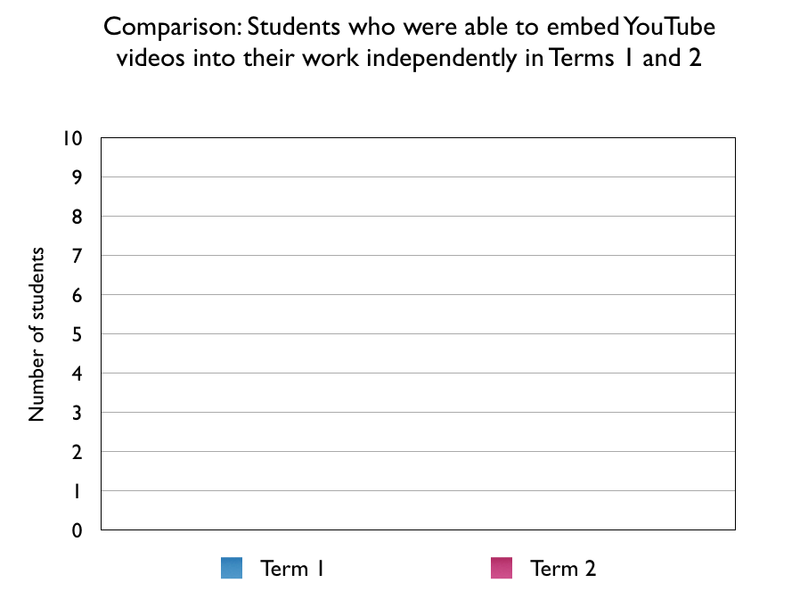 Eight of ten students watched You Tube videos independently, yet in term 2 only three of ten watched You Tube videos independently. Obviously there is a decline of You Tube watchers in the Year 5 group. This could be due to the students being exposed to other forms of digital learning such as blogs, Google Apps and other Web 2.0 tools that they are focused on these tools. Also they have had the legalities explained to them about creating accounts for social network sites. This is still work in progress. 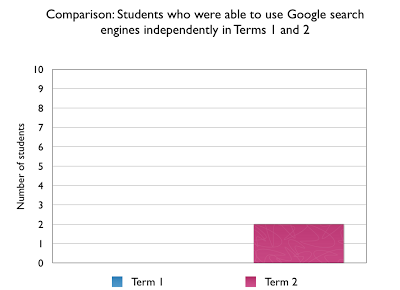 In term 1, I wanted the students to concentrate on using Google Apps and Blogger successfully. I can see You Tube videos would have a lot of potential at the end of a student presentation or in a Popplet in presentation. This can be taught later in the year. 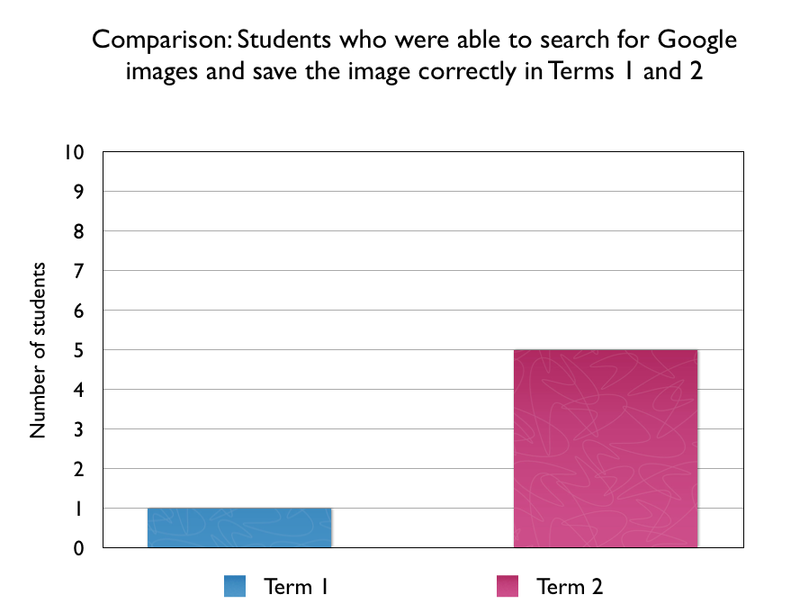 In term 1, one out ten students were able to search and save Google images successfully. 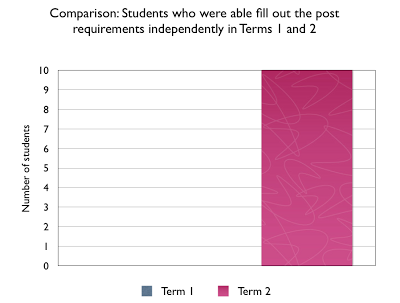 In term 2, five out of ten students were able to do this. One of the reasons for the increased number was that back in term 1, the students had the opportunity to make a presentation on a chosen war and conflict. As part of their learning they had to find legal images that they could save and upload onto their presentation. Five students within this group could not do this independently and had to rely off the Manaiakalani Teacher Aide and Year 6 students to help them throughout this process. More work needs to be done in this area. It is work in progress. At present students are learning about Smart Media and Smart Footprints. Lessons and awareness clips are on the class site. Hopefully by term 3, there would be an increase of students who know to be a Cyber Smart Learner and would have knowledge in this area. In Term 1, only three out of ten students know how to care for their Netbooks / Chrome Books. 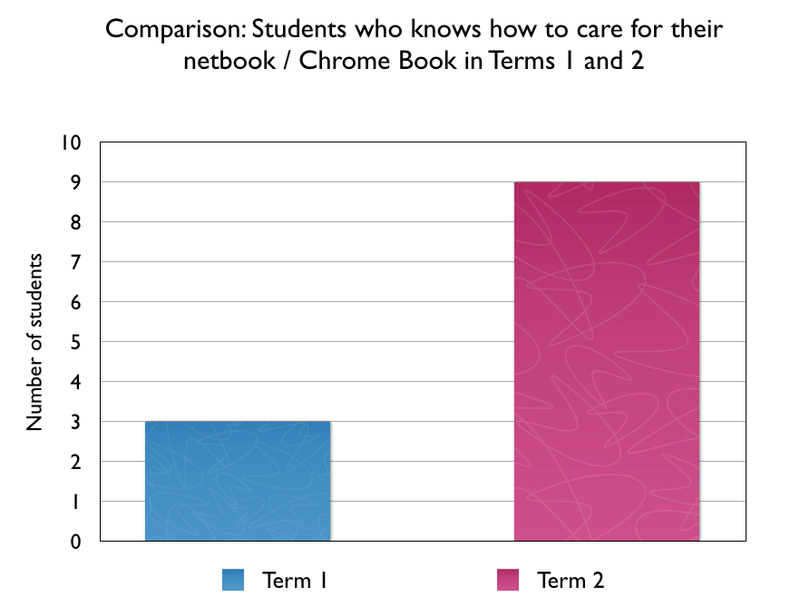 In term 2, nine out ten students knew how to care for their netbooks independently. This might be due to having parents going through the parent training and for eligible students to take their netbooks home. Also I spend time going over ways students need to care for their netbook / chromebooks and go over conditions around repairs, warranties and insurance matters. What difference can I make when children at Year 5 level enter a 1:1 digital learning environment and what skills are developed over time? What are you going to do? I will be using a semi structured interview process. I will be using a checklist to measure the skills the children currently have. I am going to this this in Google forms as I can compare responses made by the target group over time. I will be gathering data and analysing data each term. The same questions will be asked. Probing will be used to explore the children’s thinking. How are you going to measure it? As a teacher I will be analysing their responses and will be implementing their needs into my planning. An example could be modelling to the class inserting a photo onto the blog, or making a comment onto someone else’s blog. The Google class site (Time table tab-weekly planning) will be used as evidence. Having a day / week’s focus on a specific need. Also taking screenshots of their progress, using the Teacher Dashboard. Using Google Forms (checklist type questions) to compare student responses over time. In Week 3 of term 1, I interviewed ten students who were new to using netbooks and to digital learning. Eight out of the ten students started at Panmure Bridge School since they were five year olds. Two of the students came from another school within the cluster. My aim of the interview was to investigate the prior E-Learning / Digital experience these students had last year, their roles and responsibilities if they had any, the management of the class blog, learning opportunities to give online feedback and the specific skills they had / needed to know to become successful digital learners at Year 5 level. Nine questions were asked to these students. 1. What experience have you had with E-Learning in your class last year? The results show that the class computers were mainly used for word processing, mainly typing of work that would go onto the class blog. Some of the work came from Written Language where students would type out and publish recounts and narratives onto their class blog. Study Ladder and Maths games were used in class. Writing was also saved onto the desktop of the class computer. 2. 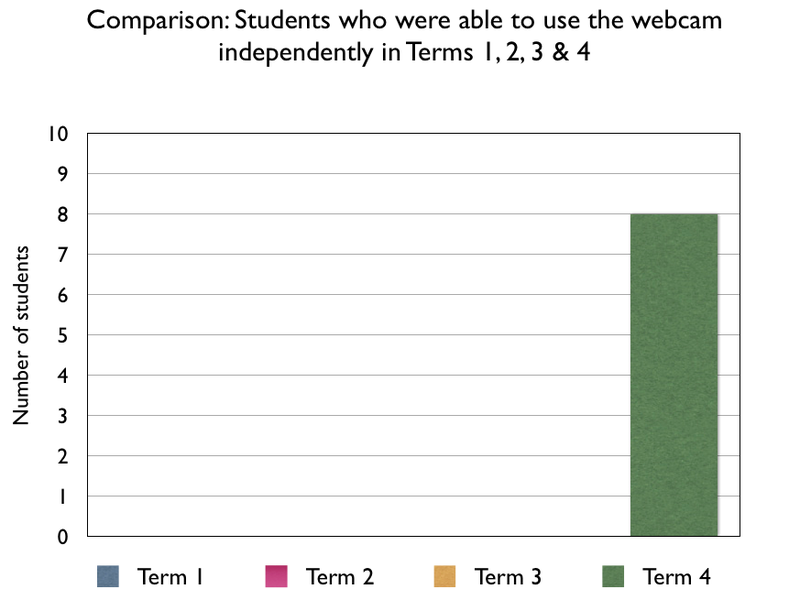 How often were the class computers used? There was a mixed response to this question. Three students said that they would go onto the class computers once a week. Some of the responses were: 2 hours a week, sometimes when I finish my writing I would publish my work onto the class blog, every day for ten minutes, a few times a week. 3. Did you have any roles / responsibilities? One of the students (Thomas) was the E-Learning monitor for his class last year. Thomas was asked to help edit other students' work before it was published online. Thomas is a highly capable student, who has excellent leadership potential. Two of the students interviewed acknowledged Thomas' role. The rest of the group said that they did not have any roles or responsibilities with monitoring the class computers last year. 4. Who managed the class blog? The class teacher was the person students saw who managed the class blog. Two of the interviewed students said the username and password was either given to Thomas to type in and create new posts or it was displayed up onto the wall for others to type in to access the blog. Students would type their work onto a new post which would have been created by Thomas or the by the Teacher. Two of the students who came from another school within the cluster said they had no experience with blogging in their class last year. 5. Did you have any opportunities to give online feedback? There was a mixed response to this question. 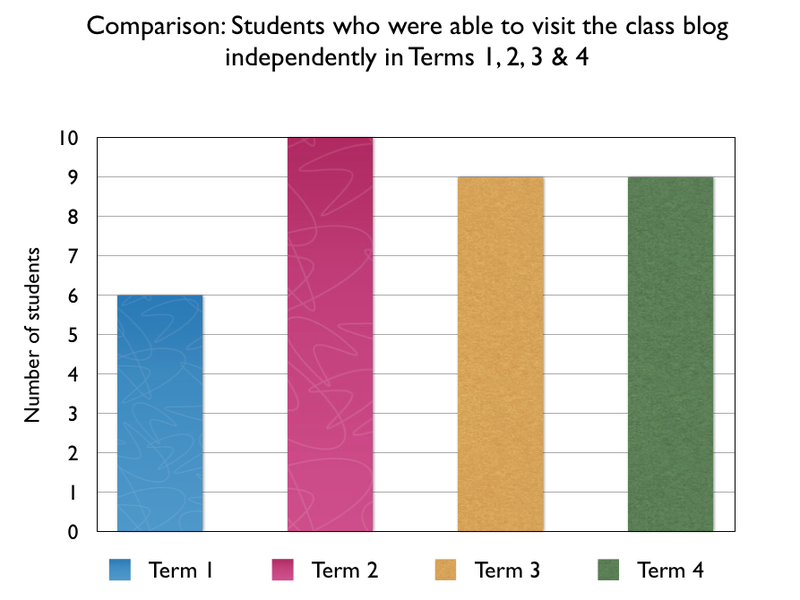 Five out of the ten students were given opportunities to give online feedback. The online feedback entailed making comments on the class blog. Three out of the five students would go on individually to make blog comments, while the other two students would make comments in a small group. 6. How were the classroom computers used last year? Six of the ten members of the group interviewed stated that the class computers were used for typing and drawing. Kid Pix was a common programme to use within the group. A minority of the group 3/10 students stated their classroom computers were used for gaming purposes. This would be either in the morning or during Maths time. The E-Learning experiences varied amongst the students interviewed. Some of the students had greater time on the class computers and would be given opportunities to make online comments. It was common that if students had finished their writing in their books they would go onto the class computers to type out their work onto a newly created post. Thomas gained a lot of experiences in his role as the E-Learning monitor. There is a need for all students to be given experiences and opportunities to be digital learners at this year level. The next set of questions were skill based questions. As the classroom teacher of this new group of students I wanted to examine: What technical skills these students would be bringing into the classroom? As I'm into my third year as a netbook teacher, I knew from my own teaching and experiences the desired skills that were needed to be a successful digital learner in Room 5. I created a checklist so that I could tick off the skills the students could independently do on their own, without the support from others. The common skills that the children were familiar with are: Signing into a Google Account, Opening a Google Account, visiting the class blog, and watching you tube videos. One of the contributing factors as to why students were able to sign into a Google Account was that the accounts were set up last year. The entire class worked with me in logging into their Google Accounts and Creating a Google Document. 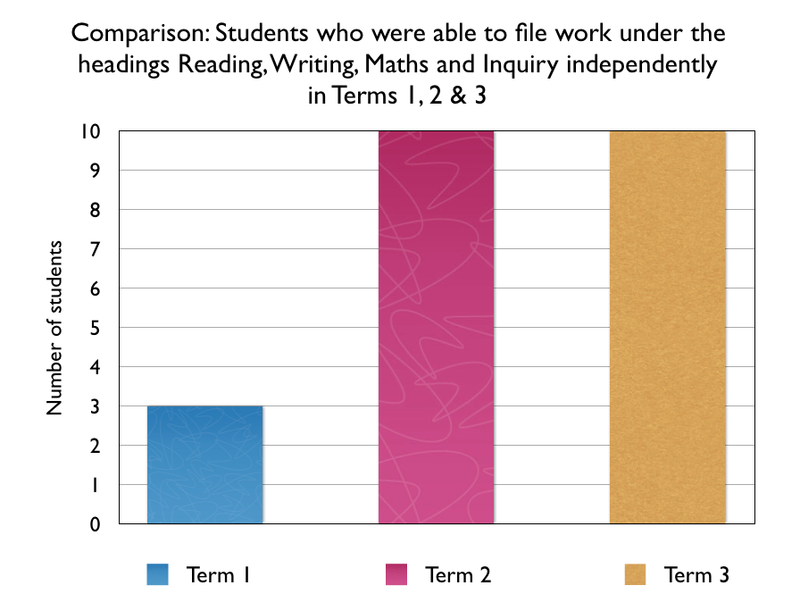 They were then shown how to file their work under the files: Reading, Writing, Maths and Inquiry. 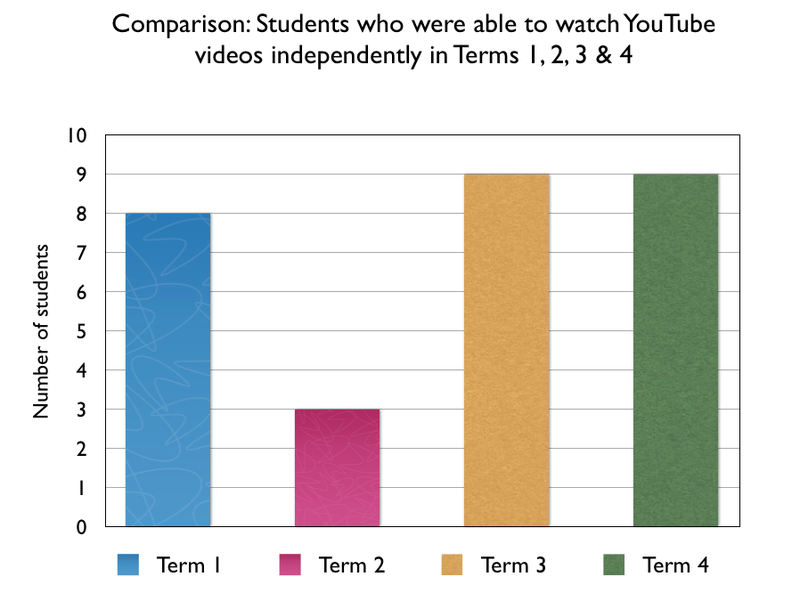 Eight out of ten students were able to access and watch You Tube videos independently. This is quite alarming and this could be down to a number of variables such as: the older siblings have You Tube accounts, parents and guardians watch you tube videos, peer pressure, trends etc. Seven students were able to make comments independently. 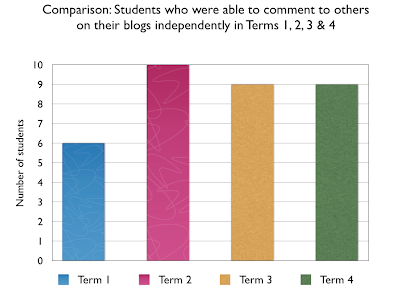 It is interesting as five out of ten students were able to make blog comments in class, yet seven students claim they are able to comment independently without support. Two out of those seven students might have computers at home which they can go on to reinforce online commenting. The ten students who have entered into my classroom have limited technical skills. This is to be expected as you don't know what you don't know. This class only has four classroom computers and so there needs to be more portable digital devices that students can access. The checklist areas are new terminology for the students and they may never have come across it. 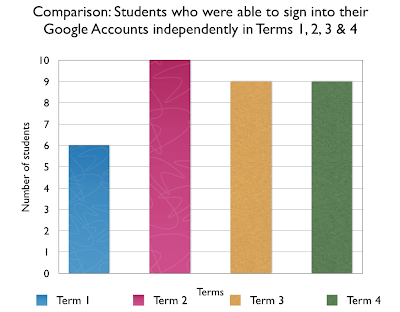 The majority of the students can access their Google Accounts. 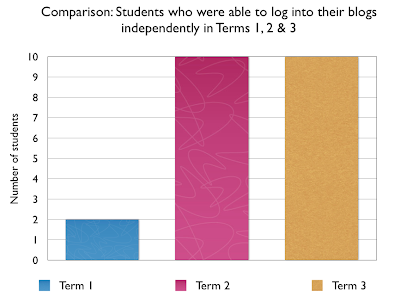 This was due to me taking a Manaiakalani Release Day last year and working with the class to ensure that the students were able to log into their accounts. During the lesson the students were shown how to create a Google Document and how to file it. On Friday April 12th, I decided to interview my Year 6 students who were taught as Year 5 students by me last year. I wanted to examine the prior knowledge and skills of these students before they got their netbooks and what skills they needed to become really successful netbook learners in Room 5. I also wanted them to identify what we / I could do better with equipping the students to be digital learners in Year 4 so that it would also be a smooth transition for them when they reach Year 5. I also wanted them to make suggestion on what they would like to know / learn on their netbook. When you got your netbook last year was there anything you knew what to do? Only about three of the students answered this question. Some of the students within the group were able to get onto the internet. Most of the Year 6's had experiences using the software programme called Comic Life to create posters on topics. One of the students was able to get onto the internet and to do research. She was familiar with using the website Wikipaedia. Did you learn this at home / school? It was a mixed response from the group. Half of the group were able to learn these skills at home, as they had computers at home while the other half of the group learnt the skills at school. When prompted about the skills that were taught to them at school, members of the group learnt to save work onto the hard drive and server, as well being taught to Comic Life at school. 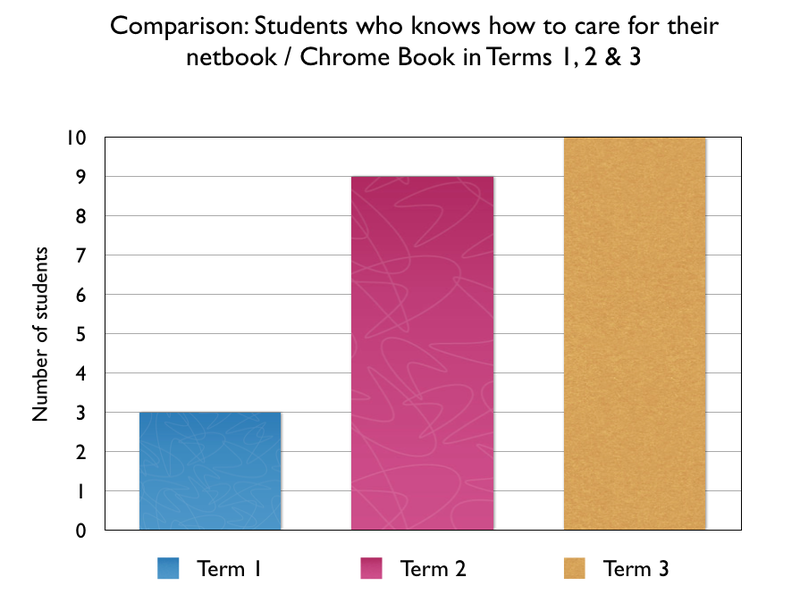 What things do you need to know to be really successful netbook learners in Room 5? What do you need to know? There were four common themes that were identified by these students on what they thought they needed to know to become really successful netbook learners. Google Apps consisted of:- learning how to get onto Google Drive, using Google Presentations, Google Draw, knowing where to go to get the documents, make copies, accessing the class site, knowing how to log into Google Apps to access email, sharing work with others so you can give each other feedback. Blogging: Logging into the blog, how to create new blog posts, editing, title, label posts, publish posts. Taking screenshots and uploading them onto a blog, using Picasa images and learning how to rotate pictures so that they can easily be uploaded onto the blog, learning about about embedding codes under HTML and changing sizing if needed. 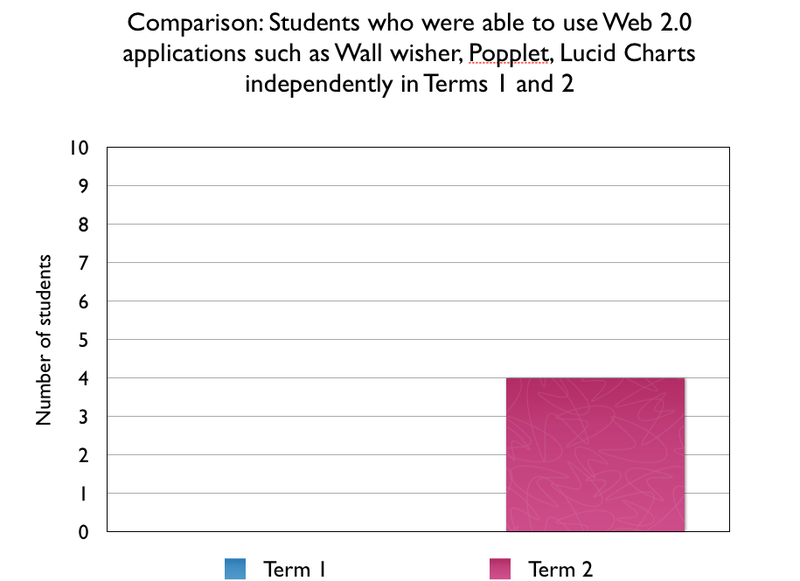 Web 2.0: Learning to use Popplet and Wordle were the two examples given. Learning how to share and accessing the embed code, so that it can be copied and inserted under the HTML tab in the blog post. Cyber Safety: Understanding the legalities of age to join sites such as You Tube, Face Book. Learning about legalities of downloading music, movies, installing games and using images (Creative Commons). Understanding who owns the email addresses: the student or the school. Teaching us about the legalities sooner, rather than waiting for the need to arise. Teacher to track history more often. Understanding the legal ages for joining such sites as: Facebook, You Tube, Pinterest, Twitter, etc. More awareness around being a safe digital learner. Students sharing their knowledge to new people on the computers. Sharing our individual blogs and showing our work to people. Telling them how to do it, how to publish work, telling them not to go on inappropriate sites. To make an orientation video for new users to Netbooks and Chrome books. What would you like to know / learn using your netbook? The students interviewed would like to use Comic Life and Kid Pix equivalents on their netbooks. The students would like to explore the Chrome Store more. To learn to use the Webcam more and to use apps that promote the use of the webcam more.